Lots of people that go house shopping today look for a place with character. Usually that means something old and a little bit worn around the edges. The kind of place that feels like home before you even move your boxes in. 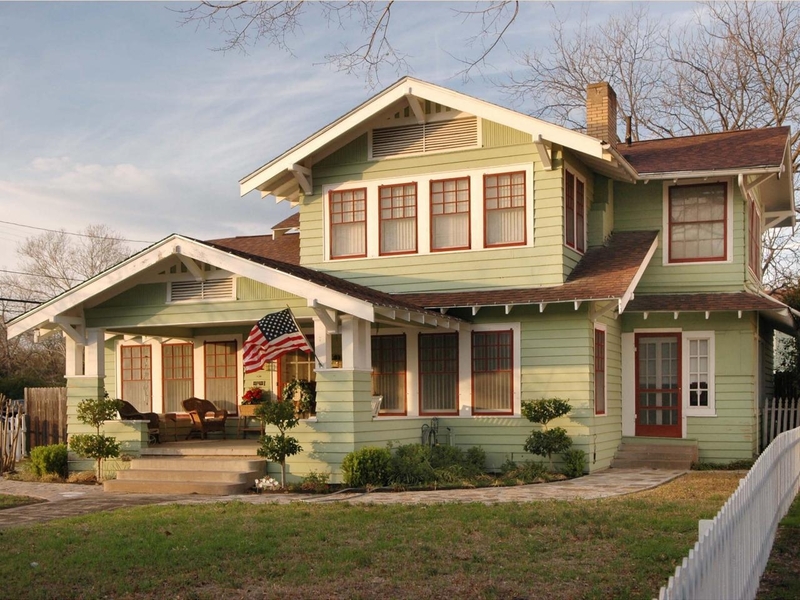 A true and honest craftsman home has that exact draw among all the old houses on the street. It just exudes personality from every nook and cranny, beckoning you to sit awhile on it’s strong stone steps. 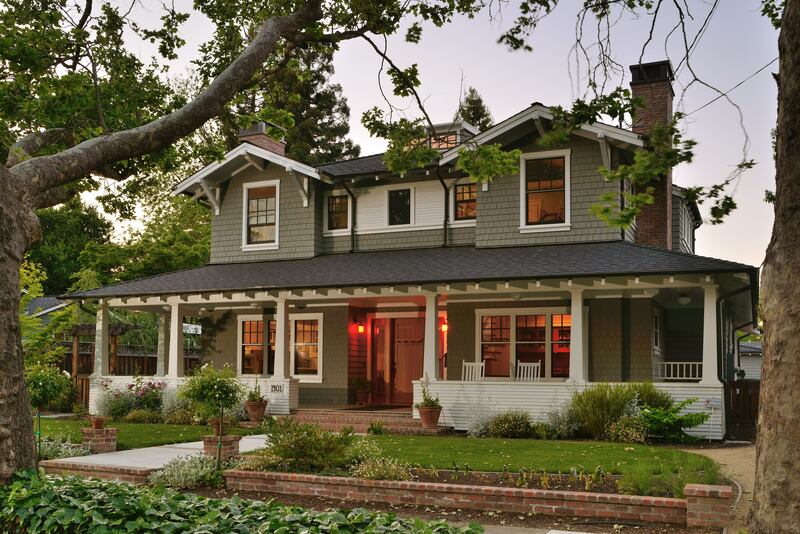 So while you’re on the market for a new home, keep your eyes open for those beautiful old homes. 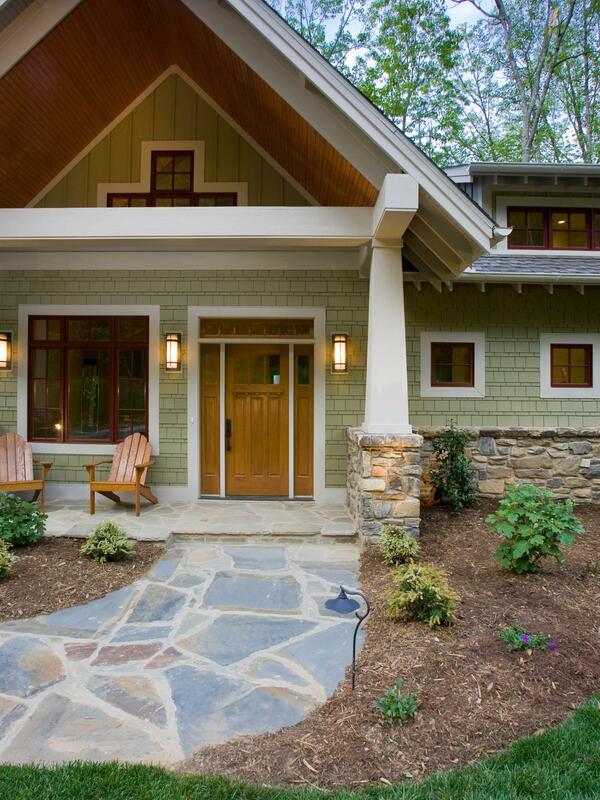 Here’s everything you need to know about craftsman style homes. 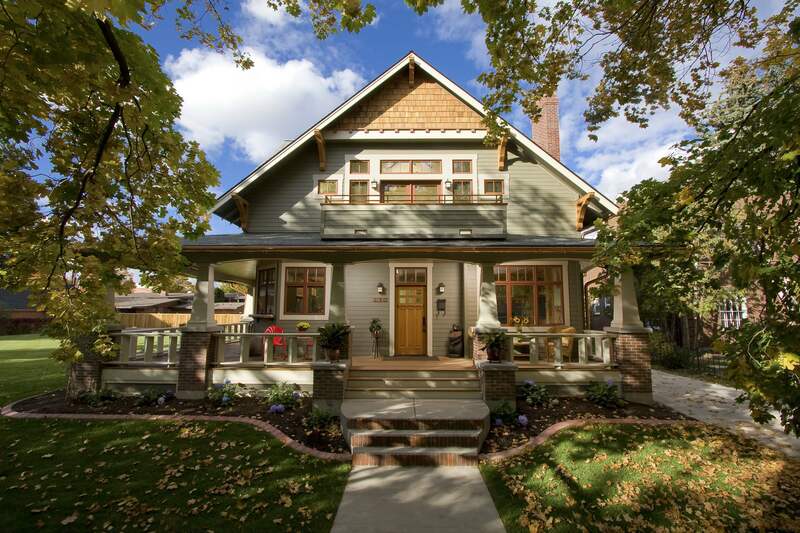 Craftsman homes first began appearing in the late 1800’s to early 1900’s in several styles with the advent of the . They gained popularity like fire because people were ready to put mass production behind them in favor for homes with character and durability. 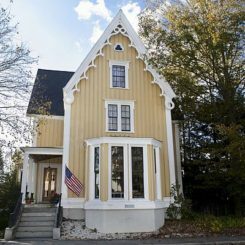 At the same time, many were wanting to move away from the cluttered look of Victorian architecture. So when something fresh and new was necessary, people took to the craftsman look to fill the void. It’s simple, clear cut lines were a refreshing scene against all the Victorian frills. 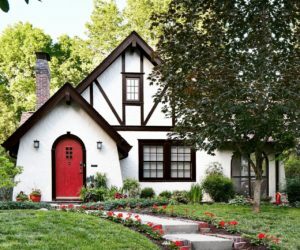 Craftsman homes earned their name from a magazine published in 1901 called The Craftsman that featured homes and furniture styles of the day. 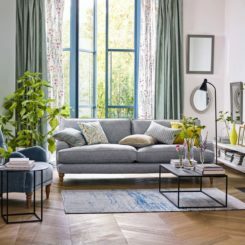 The style continued in popularity until the World Wars when modernists took the trending reigns but even then the craftsman wouldn’t be forgotten, making a comeback in the 1990’s. You probably recognize it more recently from many classic 90’s movies. 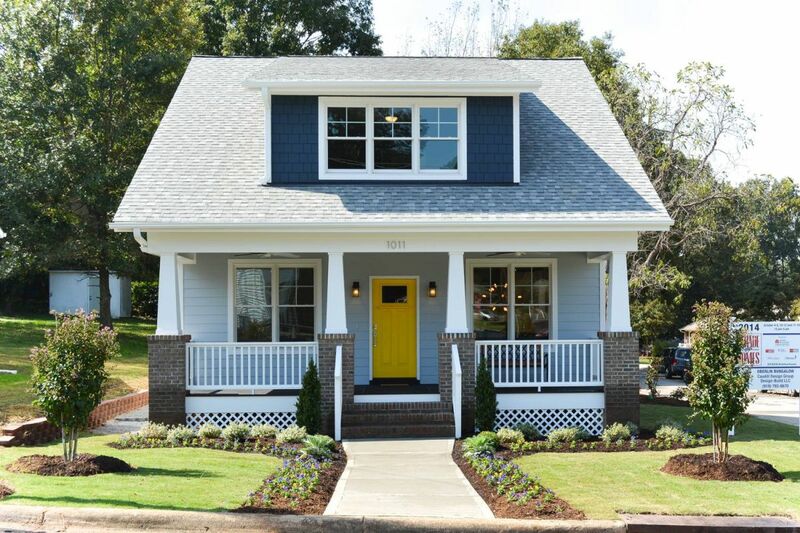 Creating a home that feels warm and cozy is a goal for all of us, but a craftsman home makes this extra easy. 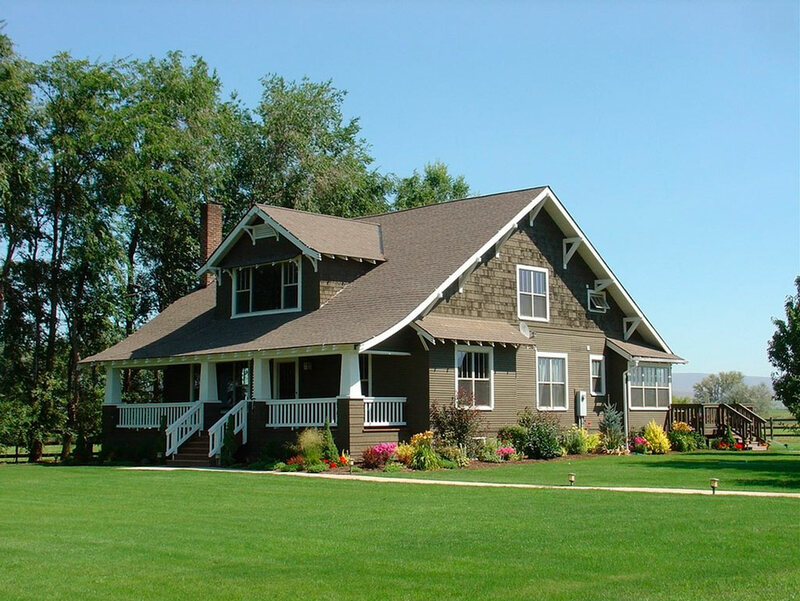 There are four different kinds of craftsman style homes: Prairie, Mission, Four-Square and Bungalow. 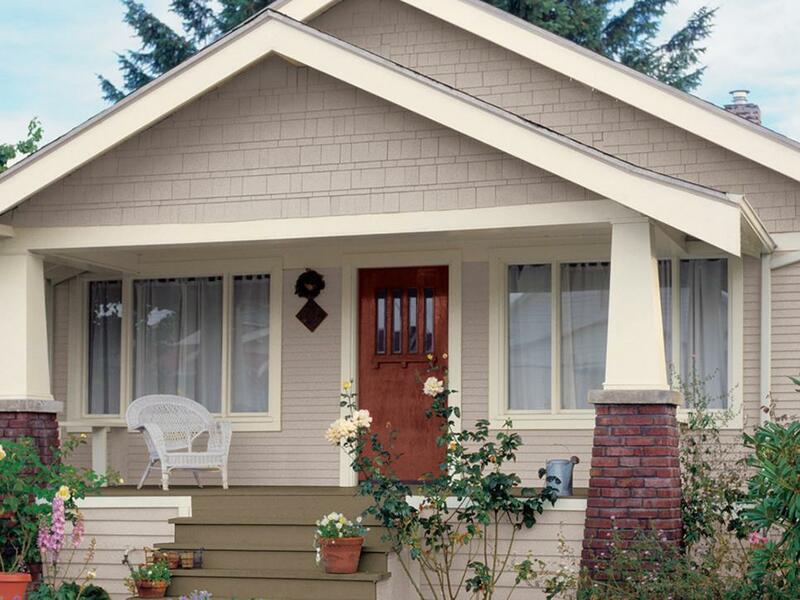 The bungalow style is the classic craftsman we all know and love. 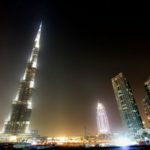 Usually they are made of wood or stone and have broad roofs. 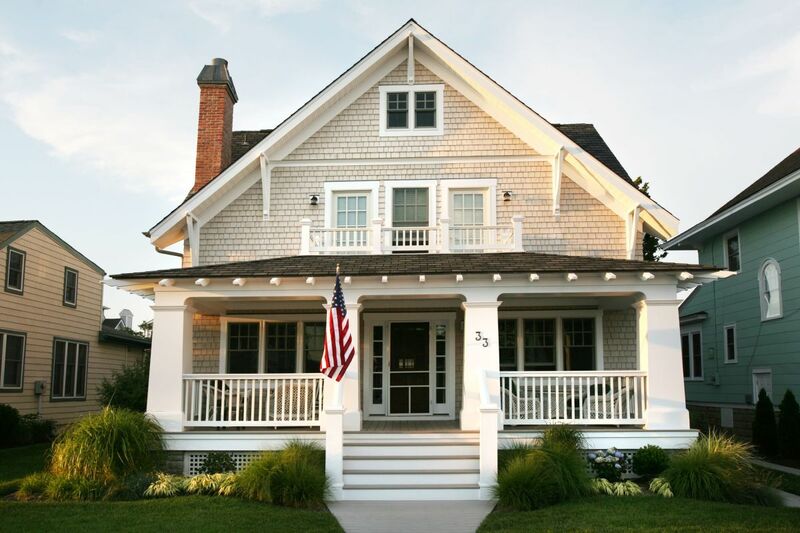 Their wide porches, supported by masonry or wood pillars, are perfect for summer lemonade sipping and fall porch swinging. 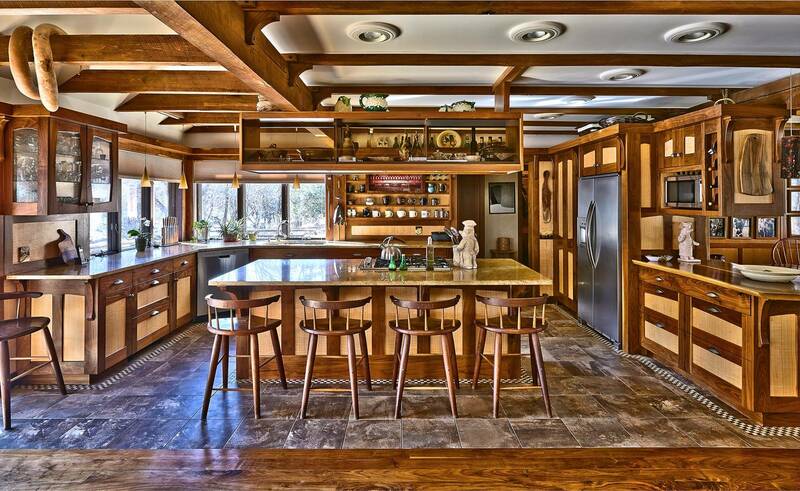 Indoors, they feature many wood elements like built-in cabinets, wood floors and open beams. 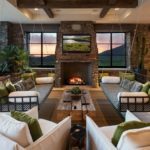 They also usually boast a grand fireplace which is a major selling point for those who live in areas with inclement winters. Whether the bungalow is big or small, it’s history and individuality will make it the perfect family home. 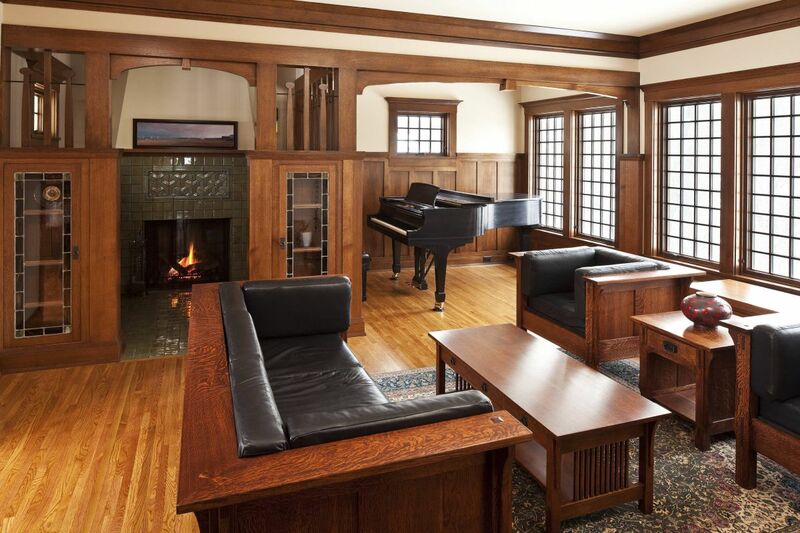 “grand fireplace”, we really meant grand. 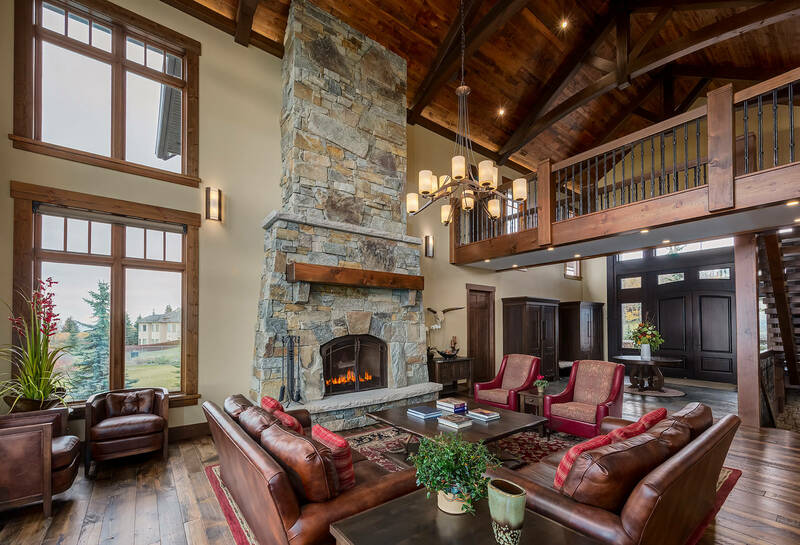 This stone beauty stretches two stories high, making you look up and really notice all the natural elements that this craftsman living room embraces. 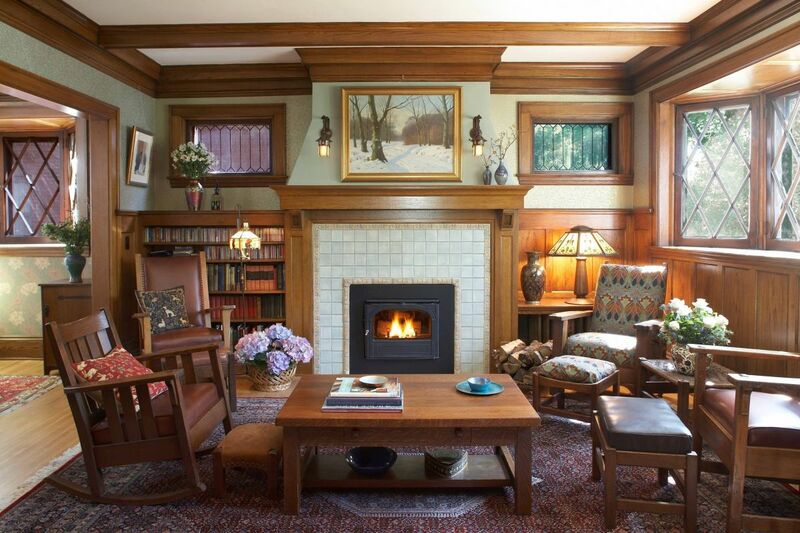 Many craftsman fireplaces are flanked by some kinds of built-in. 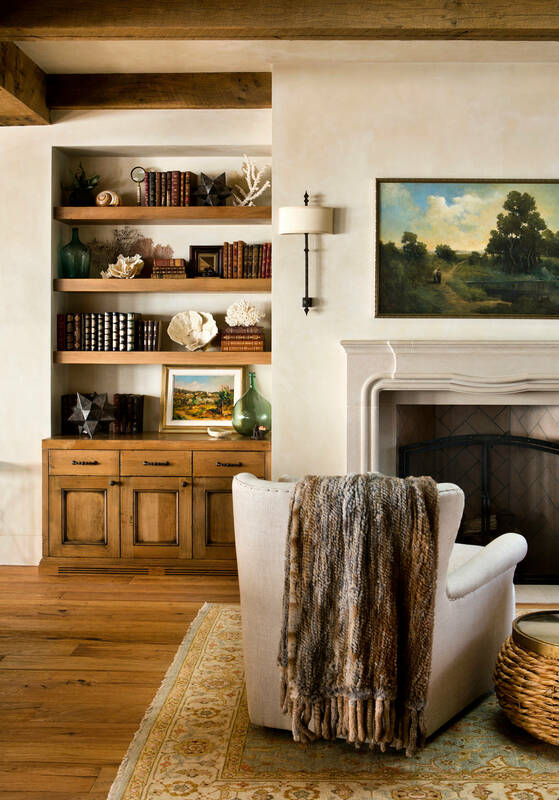 Bookshelves, cabinets, whatever the case, you can really play up the whole wall and help make your fireplace the center of attention. 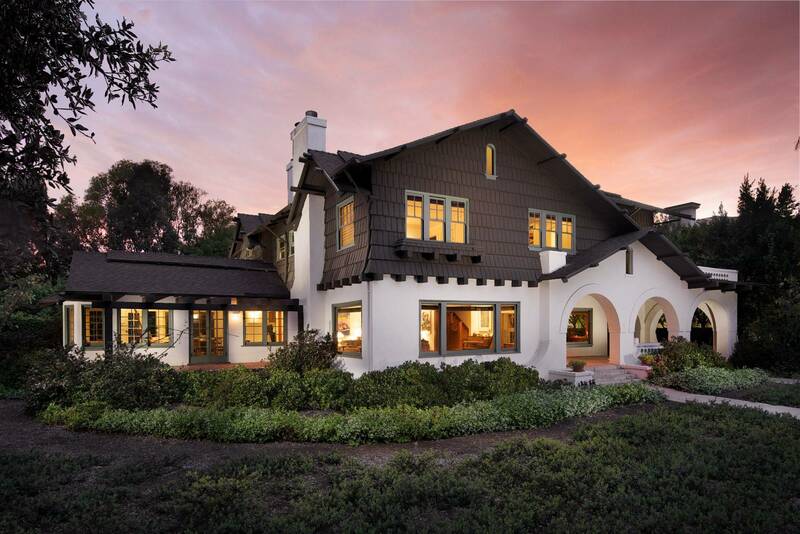 Wood trim is a major highlight in lots of craftsman homes. 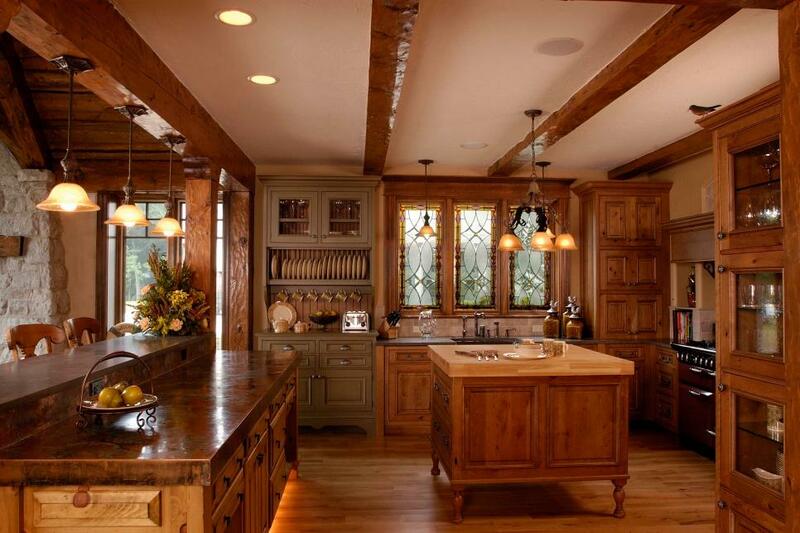 So it makes sense that you would take that beautiful woodwork all the way up and cover the ceiling with it. It it’s not already a feature in your home, it should be. furniture takes up much more space than the furniture of yesteryear. 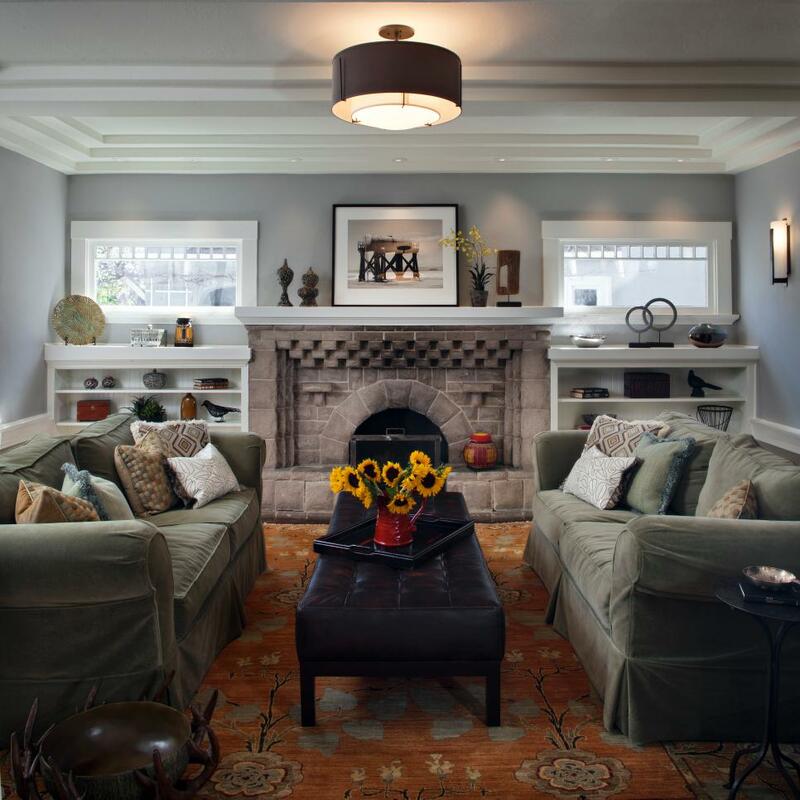 If you’re finding your living room looking too dark and heavy, consider painting your trim white. It will give you that sweet farmhouse look that many are so eager to adopt. While you’re painting, you might as well keep on with that paint brush. 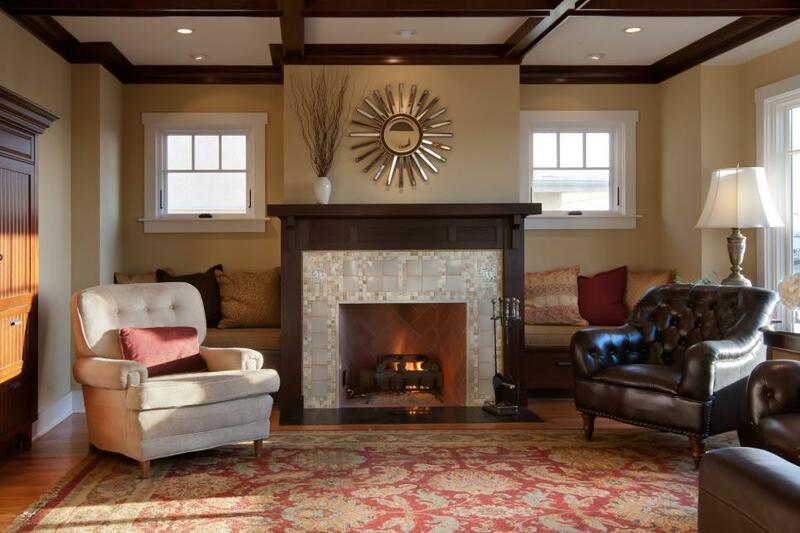 Once you’ve finished the trim, you have our permission to paint the fireplace mantle and the bookcases as well. Any built-ins will automatically look fresher and brighter with a new coat of paint. 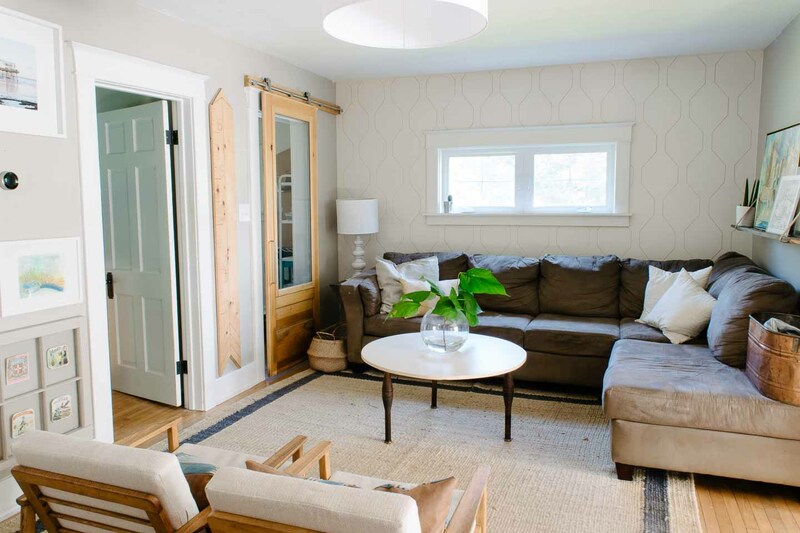 , when built-ins are mismatched, it can be tempting to tear them out altogether. Resist the urge. 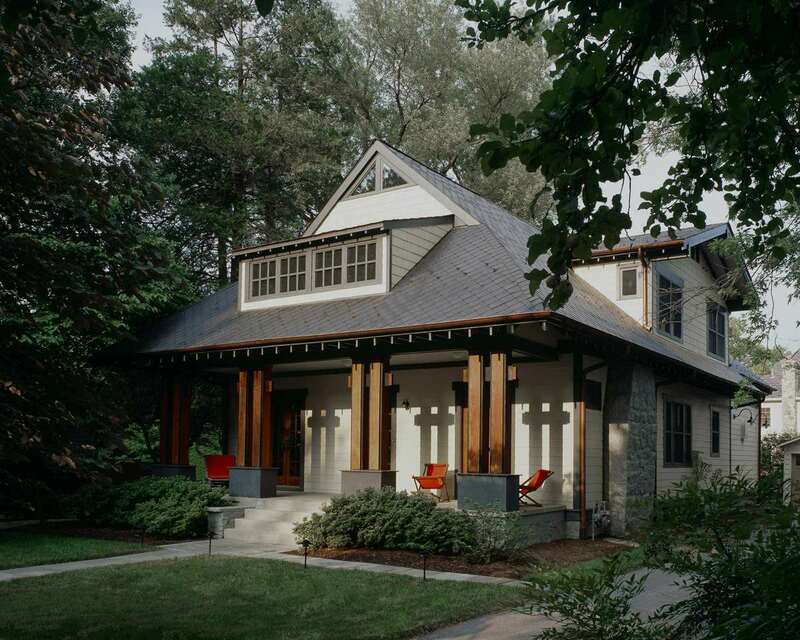 Many craftsmans, like other kinds of older homes, have very little storage space. 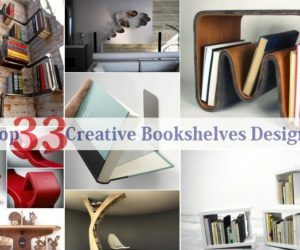 So you’ll want all the bookshelves you can get. Windows can be a sore spot for old home owners. On the one hand, windows are expensive and likely to be frugally chosen. 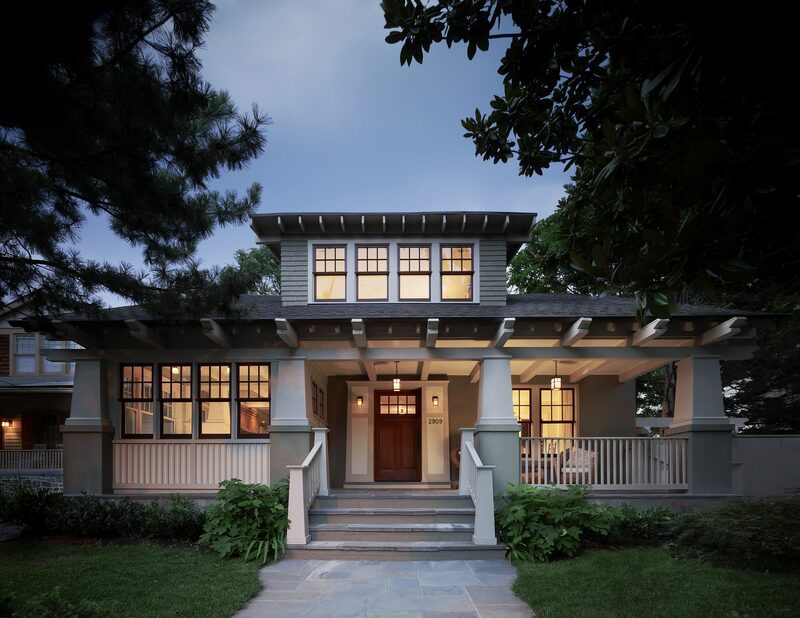 On the other, a craftsman home isn’t the same without it’s unique windows. 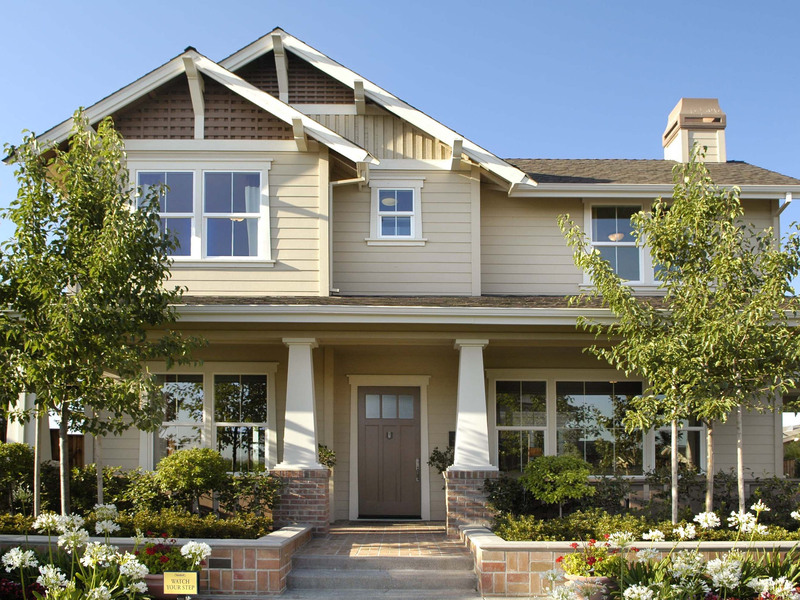 If you’re replacing yours, consider carefully how your home will look without the extra panes. way to save on window replacements is to thrift your actual windowpanes and have them installed by the professionals. 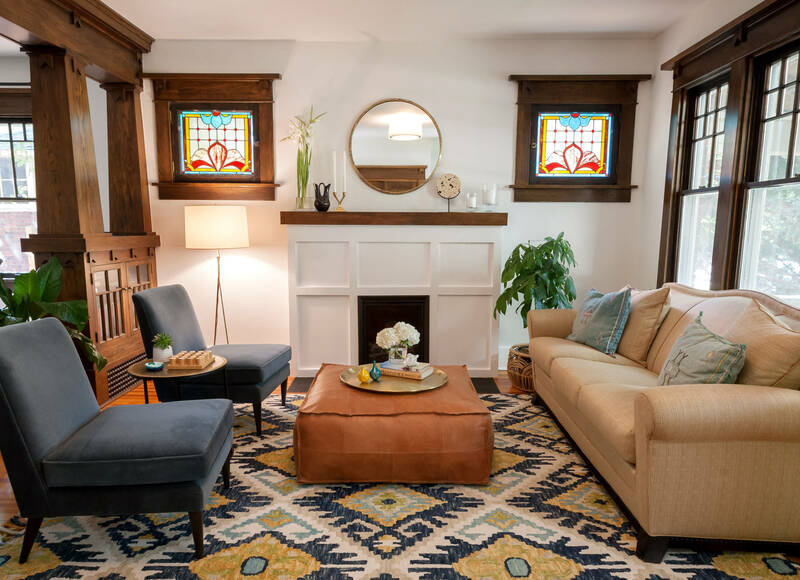 Go looking for those stained glass beauties from other buildings to add a bit of flair to your living room. Oh for a pair of built-in benches. 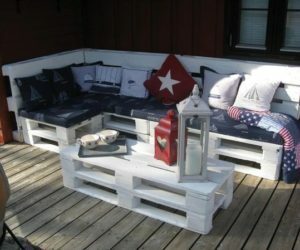 Some might see them as inconvenient but when used correctly, they can add depth to a room, not to mention extra seating. If your craftsman doesn’t have them already, consider adding them to your fireplace. 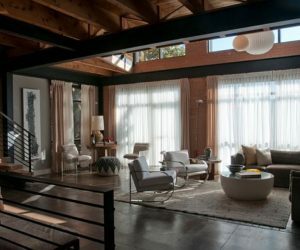 Is your living room for your family? 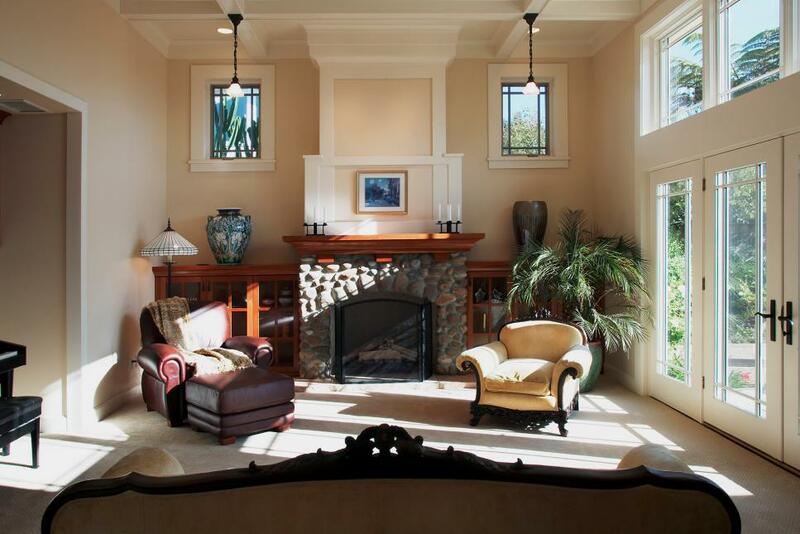 Consider hanging your TV above the fireplace. When framed in all that thick beautiful craftsman wood, it will almost look like art instead of entertainment. Let’s not forget about the ceiling. 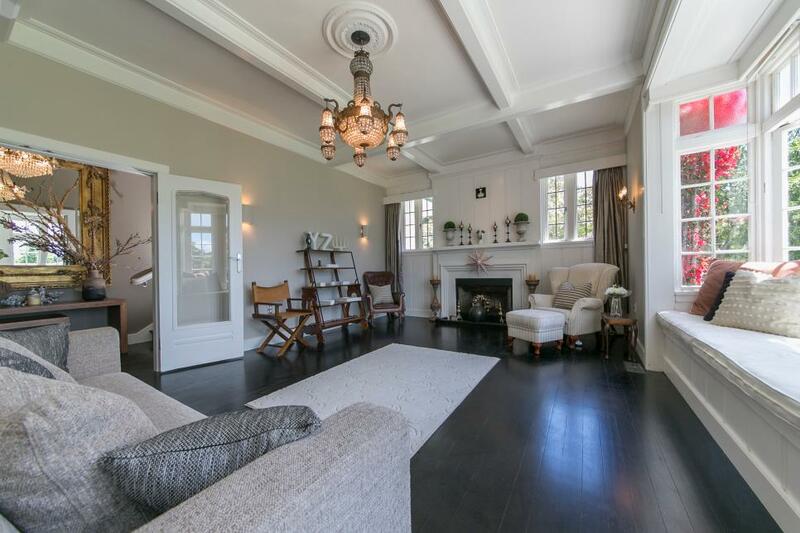 If you have a coffered ceiling in your craftsman, consider yourself lucky. You don’t have to do anything else because those lovely beams will make your space feel so cozy and welcoming whether you have a fireplace or not. Of course some might want the height of the room rather than low beams. Rather than taking them out completely, paint them white so they’ll blend in against your ceiling. Saves you money and your home’s character. 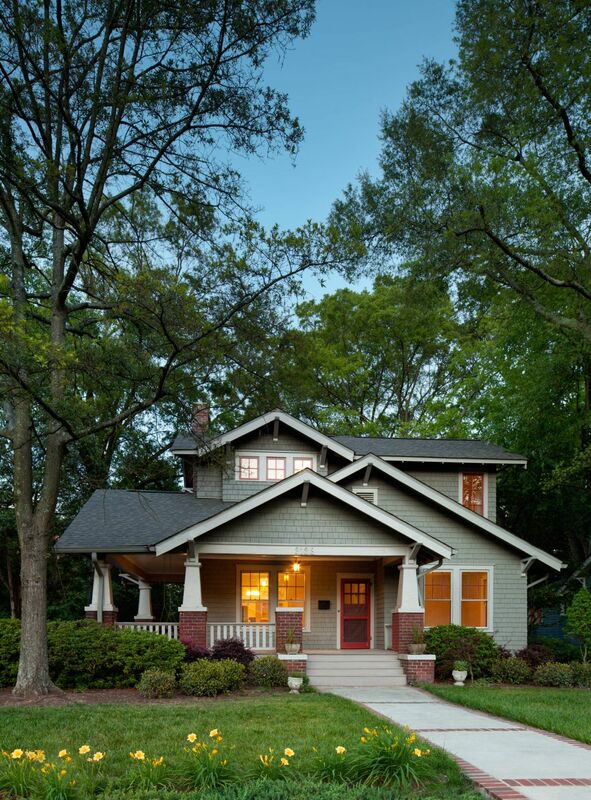 of character, many craftsman homes have so much that you want to preserve as much of it as possible. 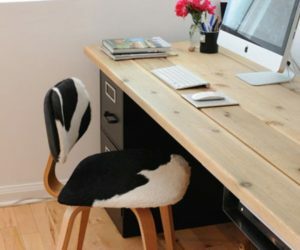 This means finding interesting ways to use those nooks and crannies that won’t fit a regular couch. A music corner or a reading nook are just two ways to make that happen. you’re reading and lamenting the fact that you don’t have any built-ins in your craftsman. There’s nothing that says you can’t add some! 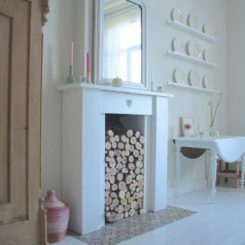 A set of bookshelves or a cabinet inset by the fireplace will do wonders for your living room and not seem out of place. 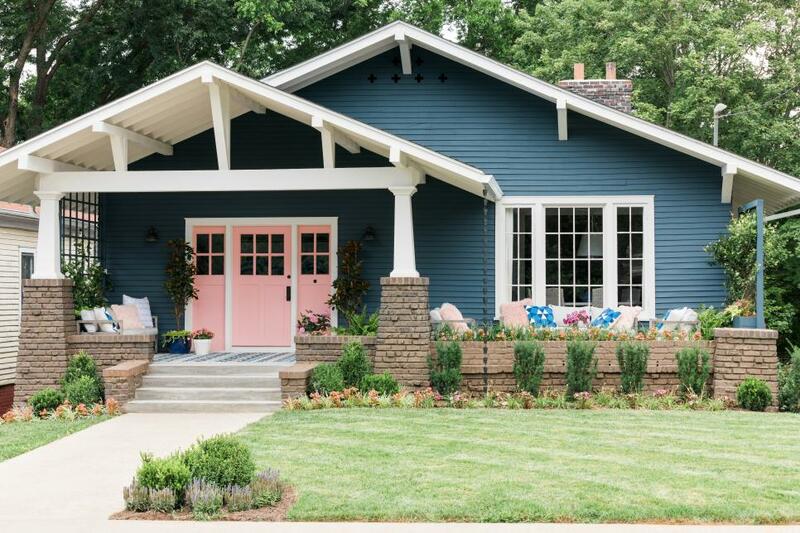 Wanting to combine your craftsman home with your farmhouse style? Go ahead and add some shiplap. 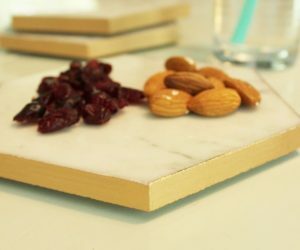 When you let the grain show through, it will help to blend with the rest of the wood around your home. 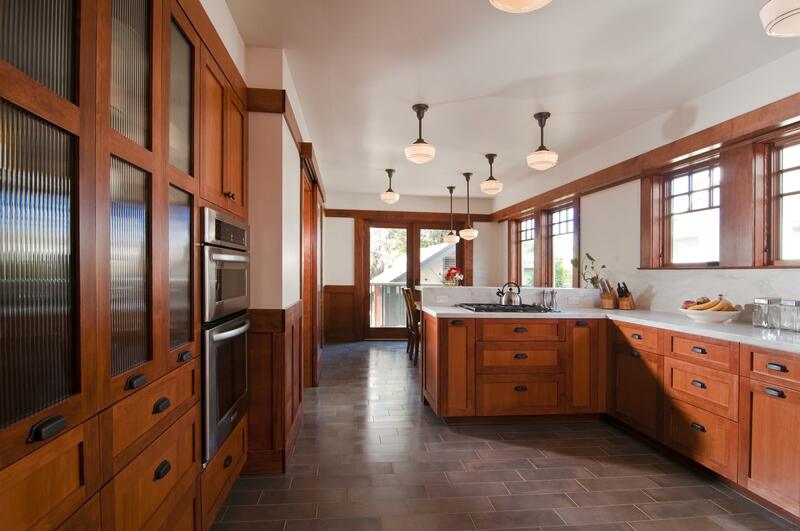 A classic craftsman kitchen is bound to hold two things; wood flooring and wood cabinetry. 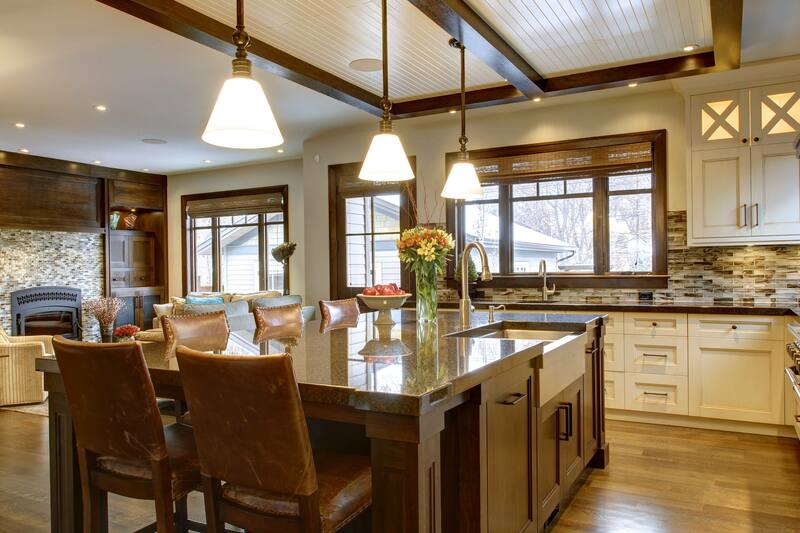 Along with all the wood trim, it’s a lot of brown tones so making contrasting color choices is important to make certain elements, like your countertop and your backsplash, stand out. 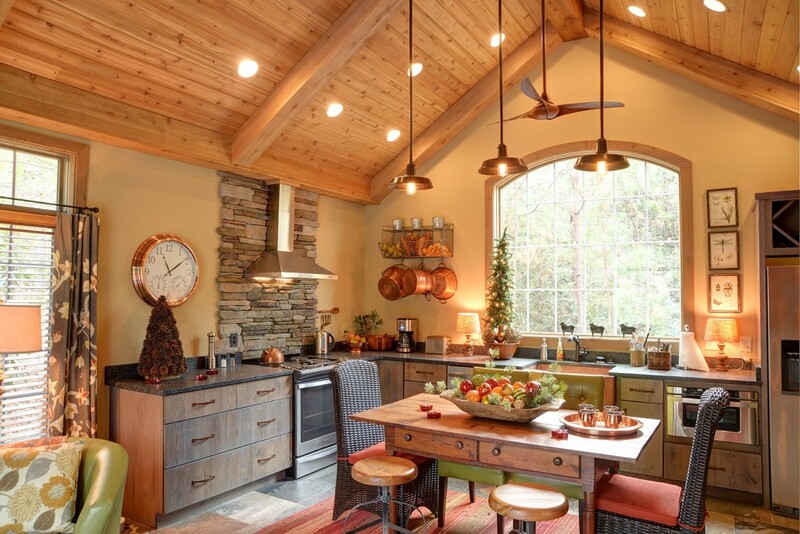 Paying close attention to your lighting options is essential in such a warm woody space. Hanging sconces help you get the light where you want it instead of trying to light up the entire room at the same time. 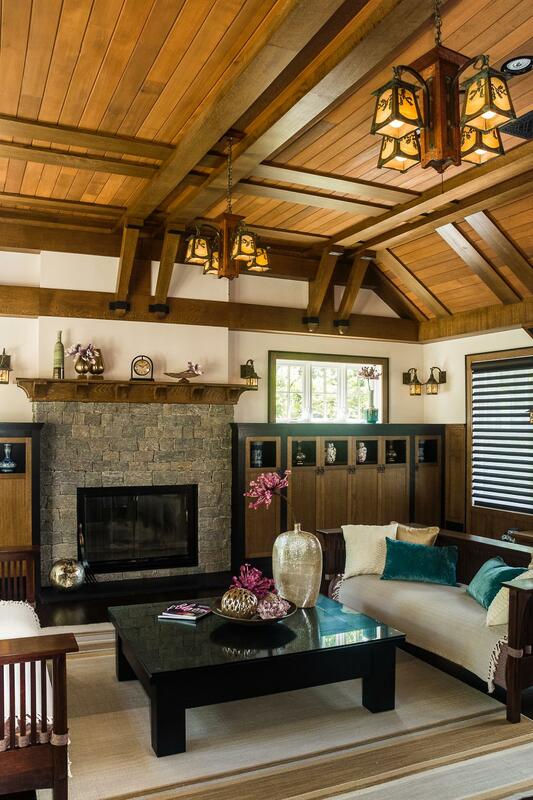 While we’re talking about the ceiling, let’s focus on those gorgeous beams for a minute. 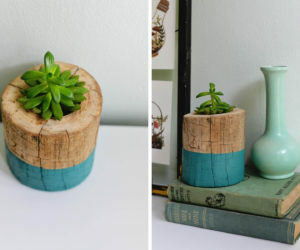 When you already have them in your living room, it makes sense to continue them into the kitchen for that rustic look. 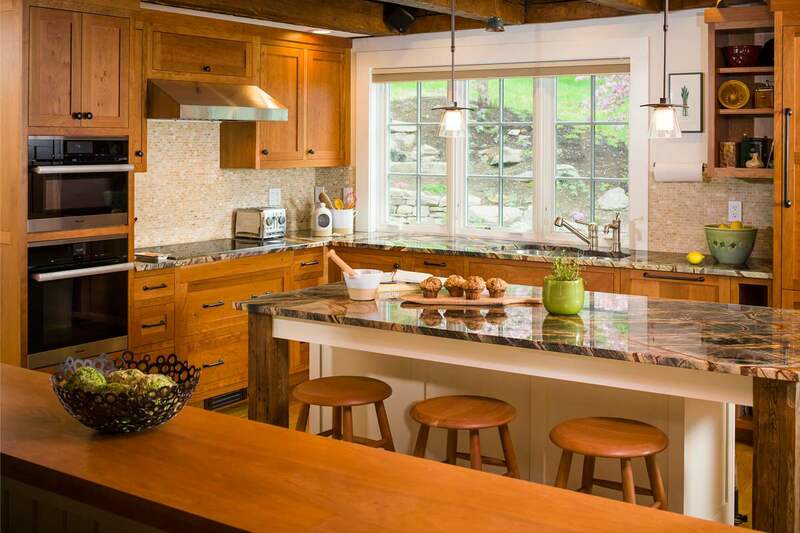 for some color in your traditional craftsman kitchen? 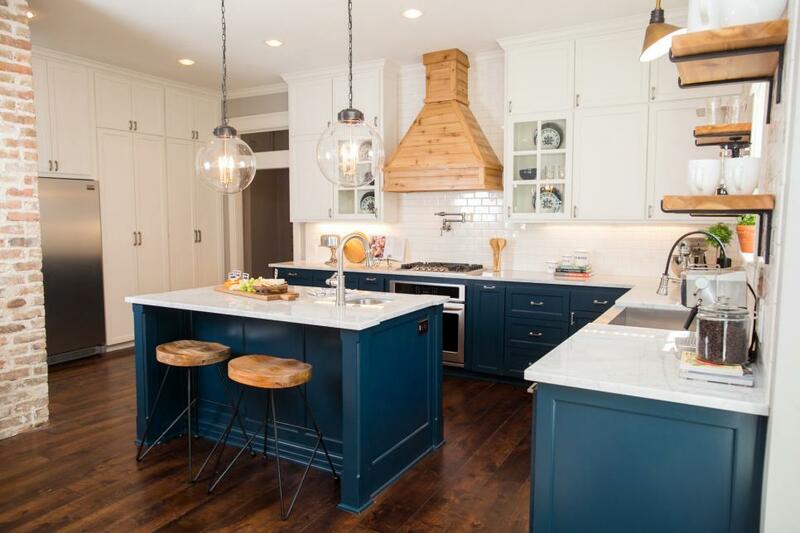 Take a leap and paint your kitchen walls a contrasting shade. 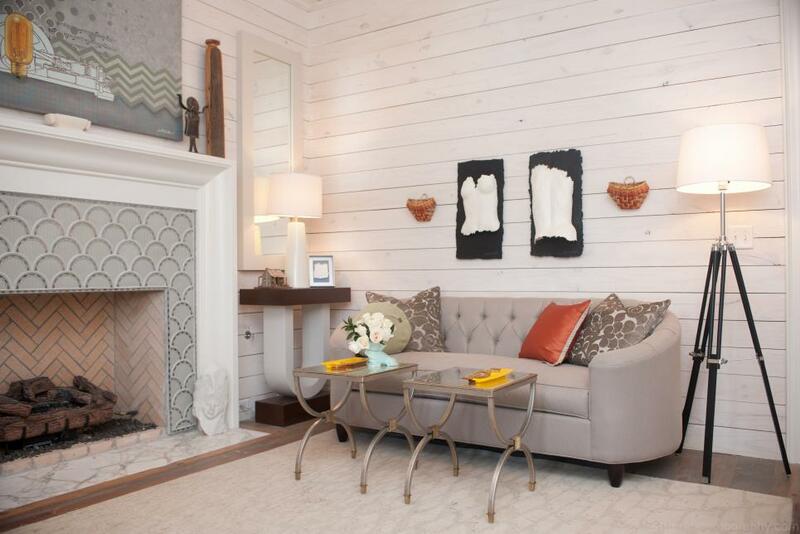 It will definitely bring personality to your space and draw your attention to the craftsman details of the room. If one plain wood shade is monotonous for you, feel free to opt for two. 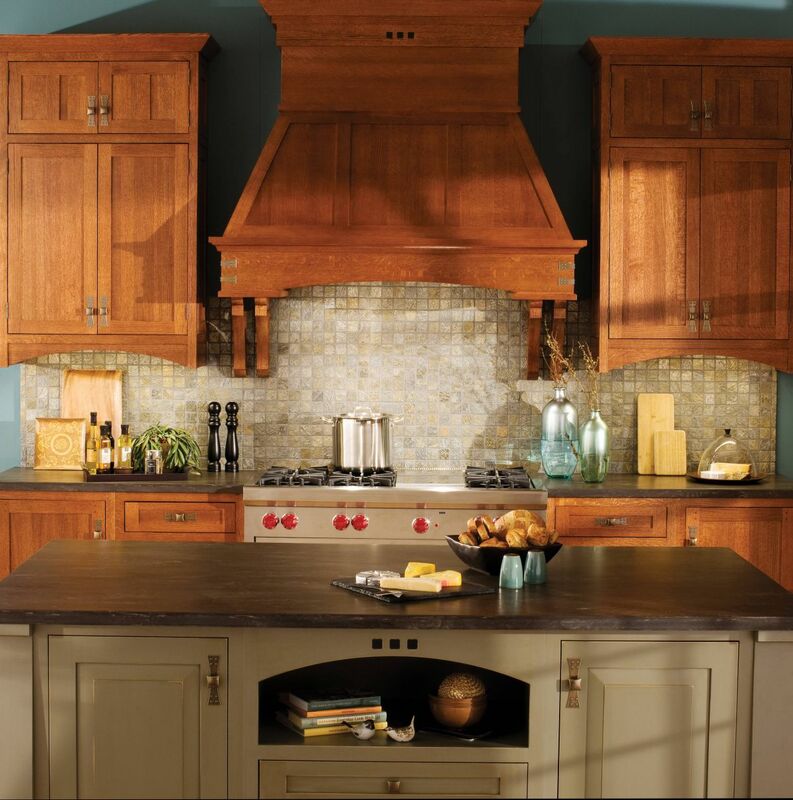 Two toned cabinets have such a nostalgic appeal, you’ll never want to leave your kitchen again. Sometimes all we need is a subtle flair of personality to bring a space to life. Look to the floor and paint a fun pattern around the perimeter, just because. Bonus points if you stain it into the wood instead. It’s pretty amazing what a good set of cabinetry hardware can do when you’re wanting to blend two styles together. Sleek modern pulls on wood cabinet doors can be just the touch of modern that your craftsman kitchen needed to bring it up to date. Is all that wood a little too much for you? That’s okay. 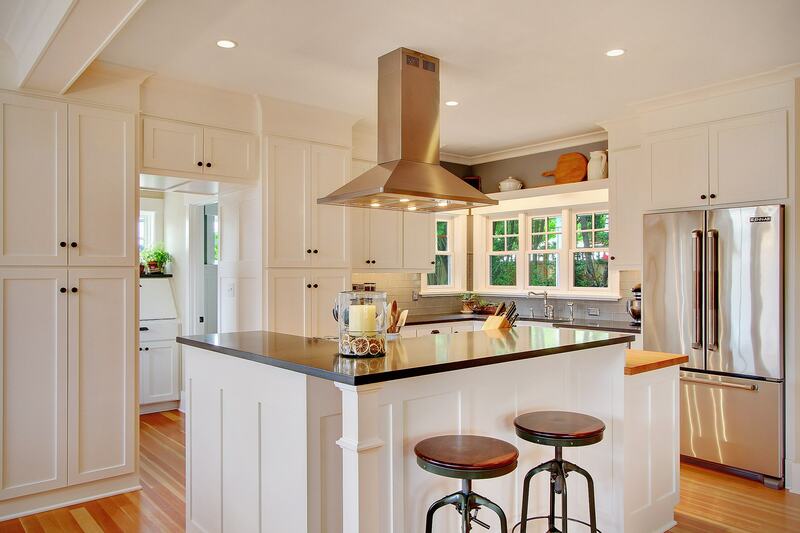 It’s your house so paint those cabinets a creamy white that makes you happy. You’ll still keep all the architectural glory, just in a lighter color. While many craftsman kitchens are well equipped with cabinet storage, it’s not a crime to add some more open shelving. Since open shelving usually has the purpose of decorating rather than storage, it would be easy to include across a window or in an empty corner. 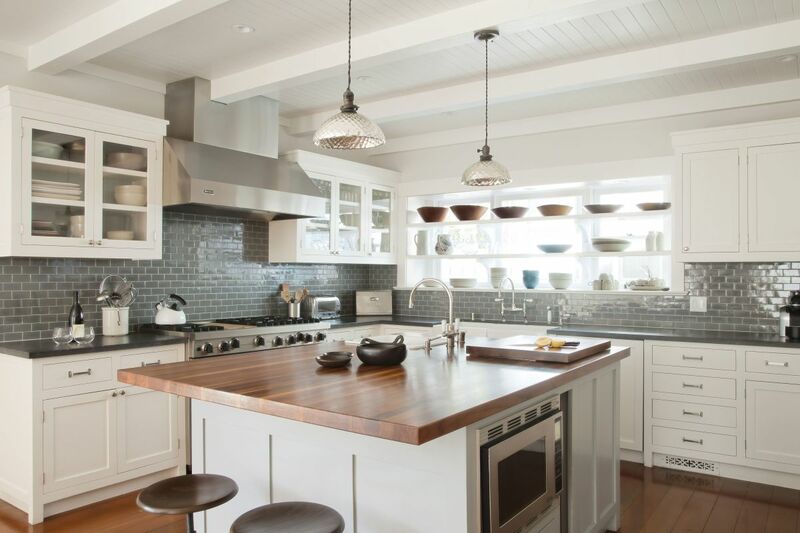 for open shelving is especially helpful in small craftsman kitchens. 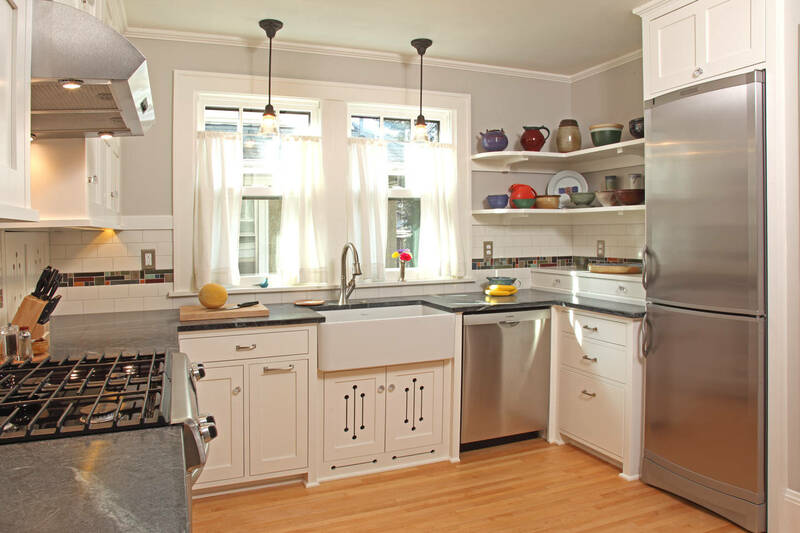 Replacing cabinets with shelves makes the space feel larger and usually doesn’t detract from the general craftsman feel. Big families all require more space. If your family is finding it hard to fit into your kitchen, consider opening it up to your other living areas and adding a large island. 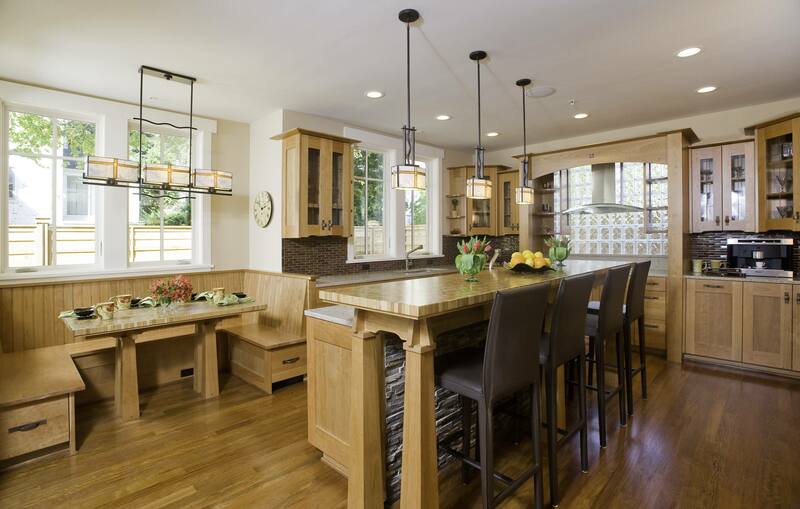 Suddenly your craftsman kitchen will be a space where the whole family can enjoy being together. option for extra seating space is to replace cabinets with a breakfast nook area. 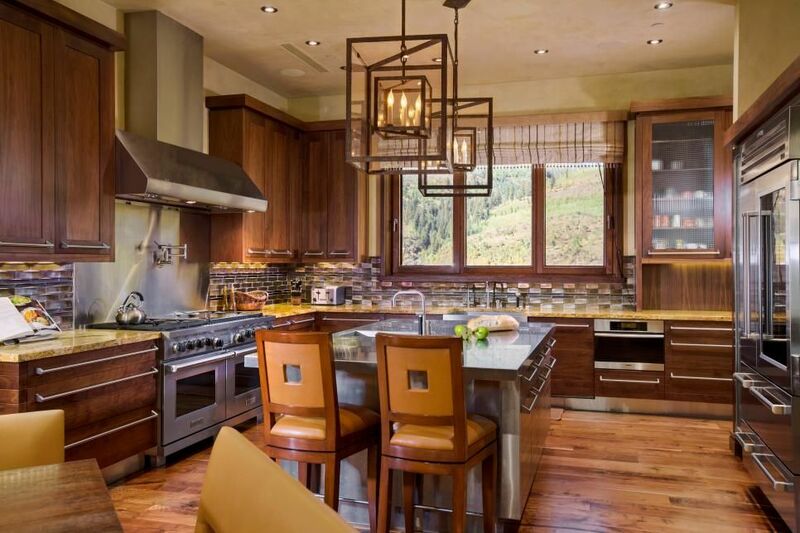 You’ll find that it will blend into your craftsman kitchen perfectly and provide that necessary coloring and homework zone for dinner prep time. 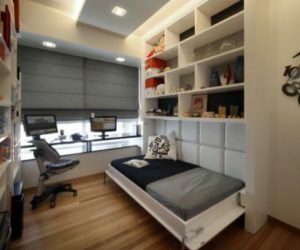 When you’re wanting more space on a budget, it requires some creative thinking. 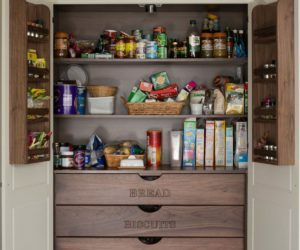 Like moving your vertical storage space to a wall of cabinets rather than keeping the cabinets above your countertop. 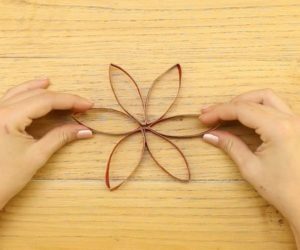 You’d be surprised how much lighter it makes your workspace. lines, you’re welcome to forgo any and all cabinets above the countertop if you wish. 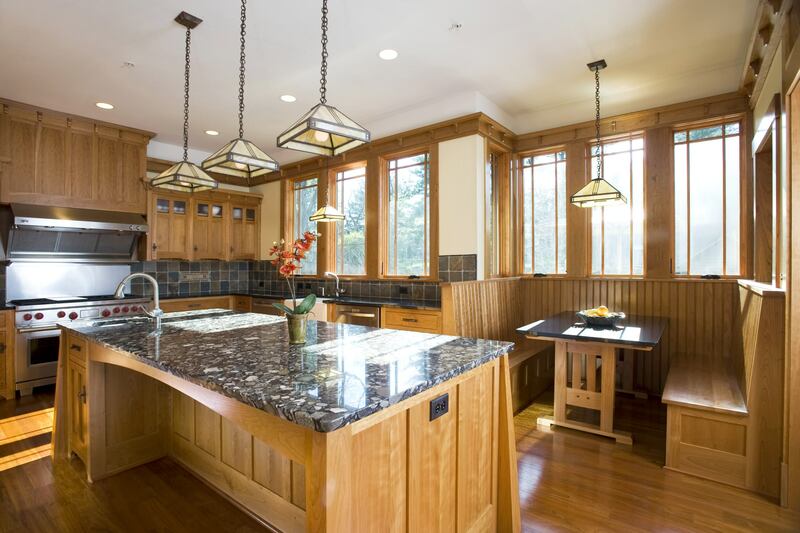 It will help you keep your kitchen tools to a minimal while drawing attention to the other features in your craftsman kitchen like the windows or the floors. 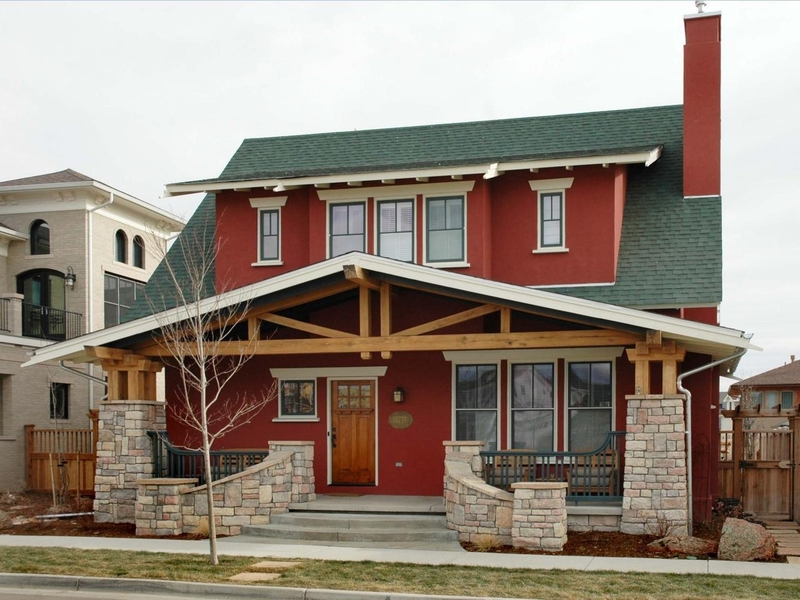 Don’t think that just because you live in a craftsman house you have to continue with the craftsman style completely. 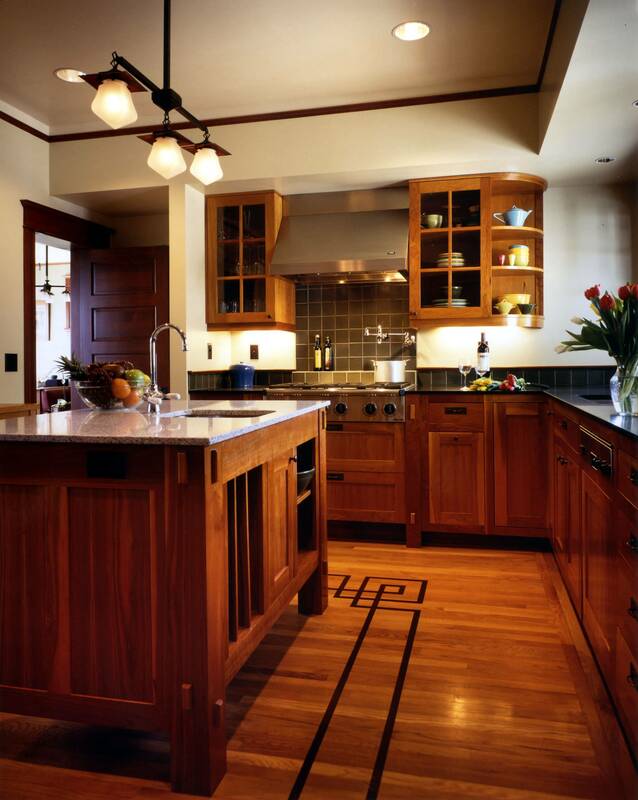 Paint your cabinets, replace doors and lighting, do whatever you need to do to make your craftsman kitchen a space you will truly enjoy. 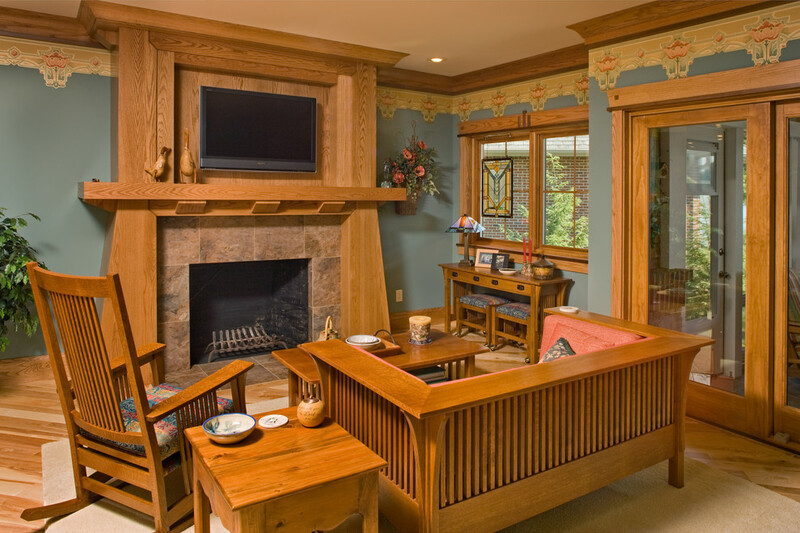 with the rest of craftsman homes, even a craftsman bedroom is decked in wood trim. 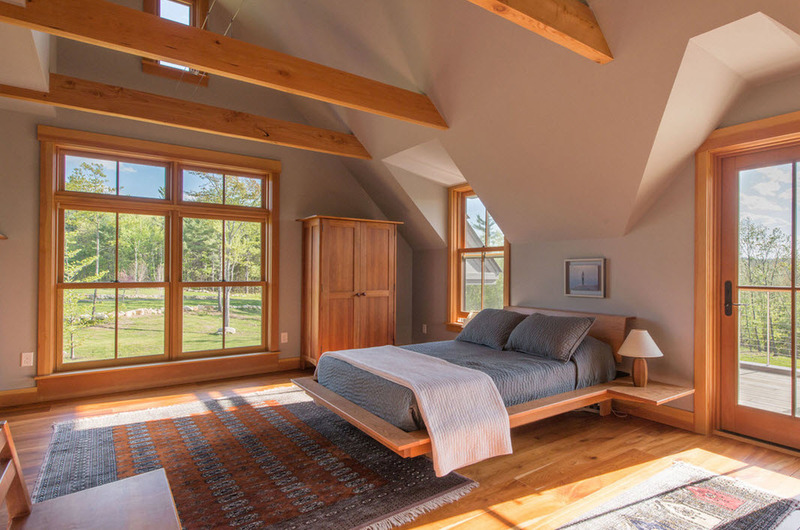 You can’t get away from gorgeous woody windows and if you’re lucky, you’ll have some built-ins too. It certainly makes styling more fun. 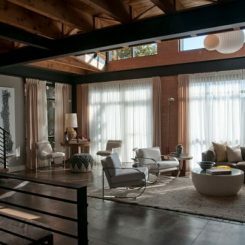 , a craftsman bedroom will be tucked away beneath the eaves of the house, creating pitched ceilings and odd little corner. 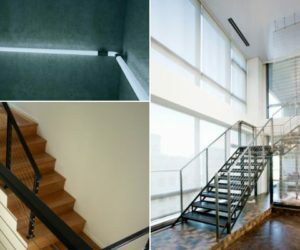 The only thing to do is embrace the unique space and find a way to use the area you have as best you can. 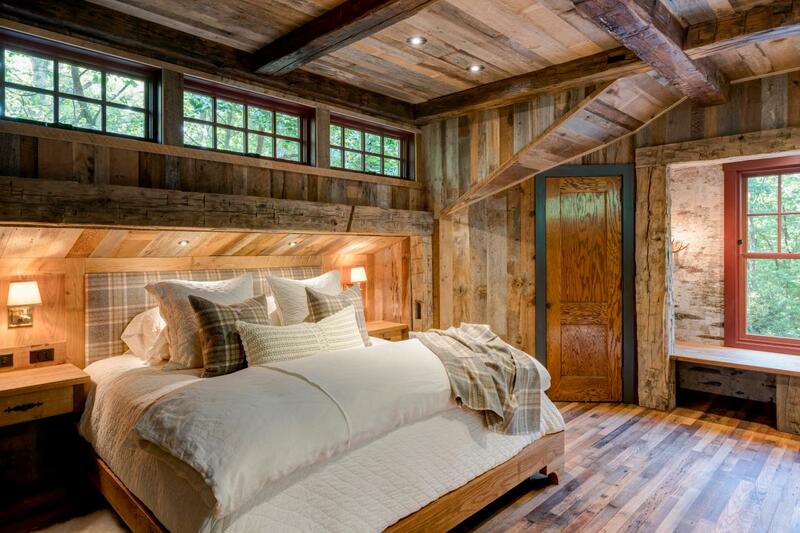 If you’re really squished into your little craftsman bedroom, consider opening the ceiling to the roofing beams above. As long as your home’s climate doesn’t get too hot in the summer months, your space should stay comfortable even without the extra padding. the exposed beams look but can’t manage to tear out your insulation altogether, put up some beams of your own. Make sure you match the rest of your craftsman’s wood and no one will ever know they were added later. Let’s not forget about storage. 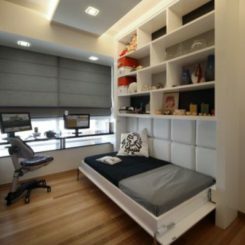 When you live in an old craftsman home, you might need to add a closet to your bedroom and this is where those strange sloped nooks come in handy. Just build your closet into it and you can applaud yourself for using all your bedroom’s square footage. 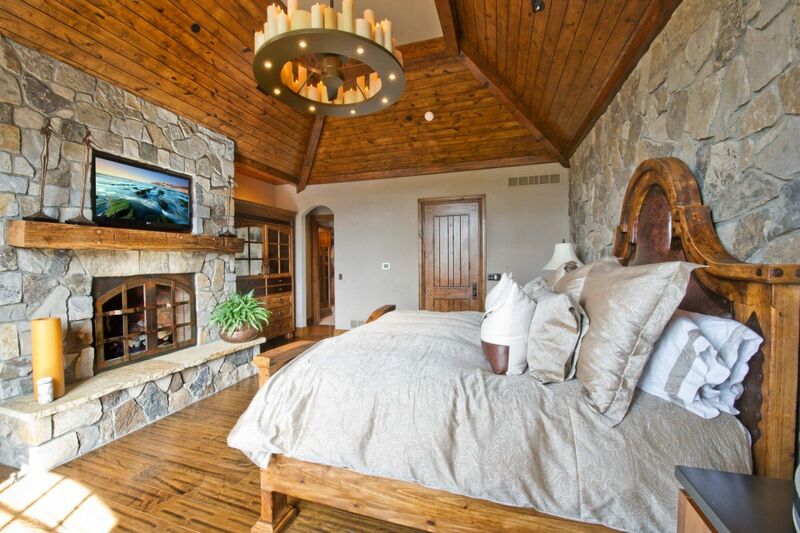 Every so often, a craftsman bedroom comes with a fireplace. 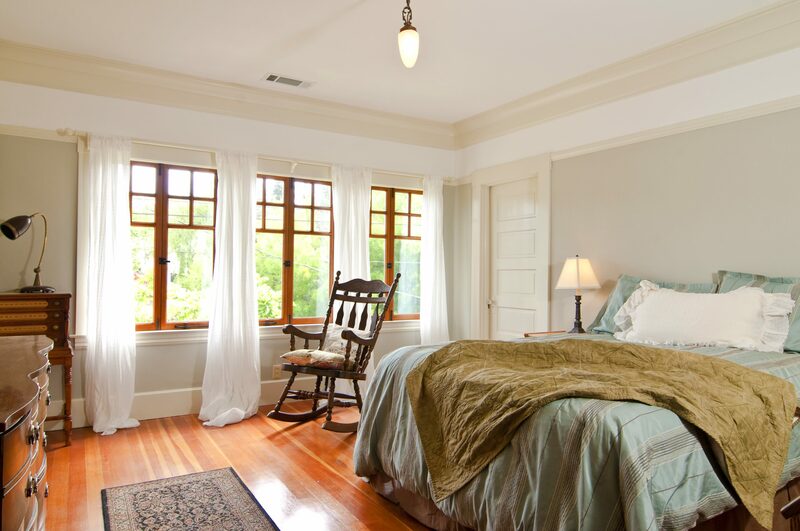 If you’re lucky enough to own a craftsman with a bedroom like that, take full advantage and make it the focal point of your space. 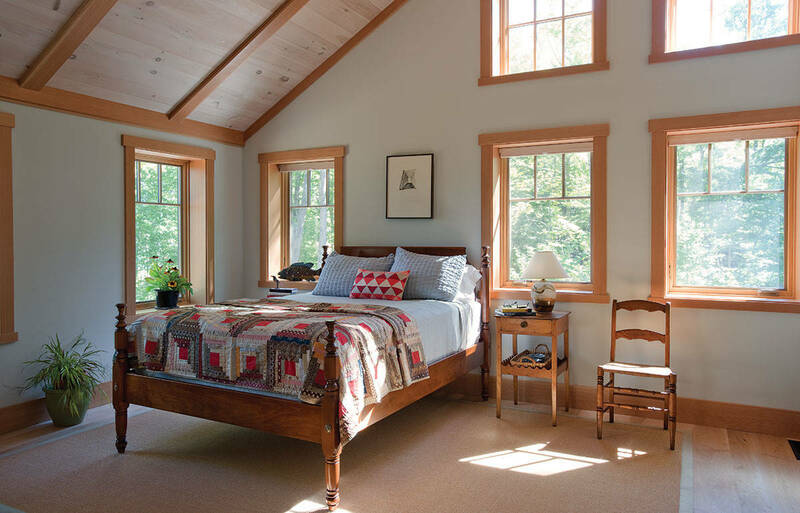 Like the downstairs rooms sometimes, an authentic craftsman can have small bedrooms that don’t quite fit all our modern day furniture. Don’t be hesitant to tear into the next door bedroom for that extra space if need be. It’s a general rule in an old house that as long as you’re keeping the unique aspects like old window frames, wide trim and squeaky doors, you can do just about whatever you want. So when you want to paint your bedroom a more modern color, you don’t have to worry about it as long as you’re showing off that trim. 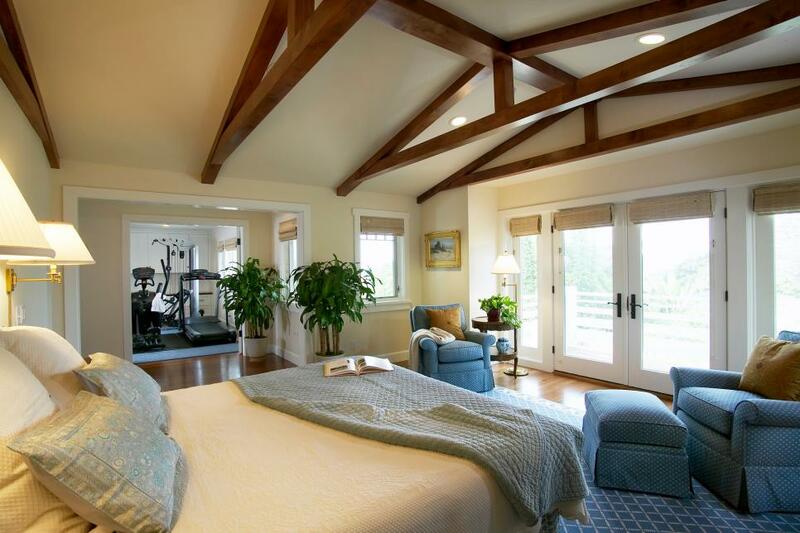 Be ready to have a multipurpose craftsman bedroom. If you have a great view from a wall of windows, you won’t find a better place to put your desk or craft table. 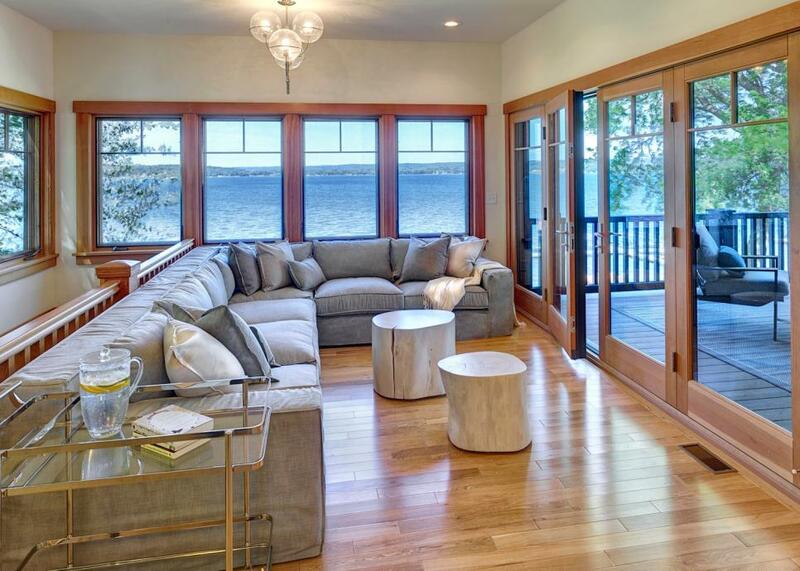 Don’t be afraid to mix the room’s purposes when you get to overlook a valley or lake. 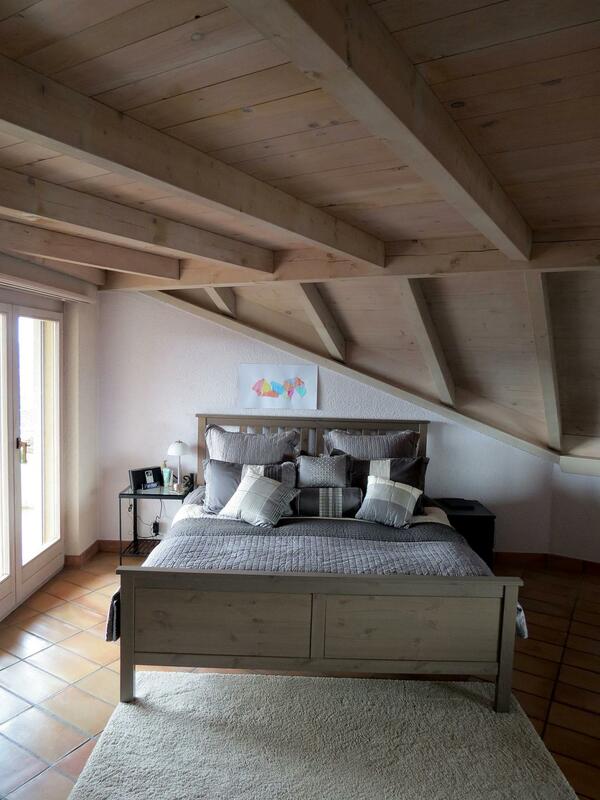 Shiplap in the bedroom? You’ve . It’s a great way to hide the past mistakes that you’re prone to find in the bedrooms of old homes while blending in with the heavy trim like it was meant to be there all along. 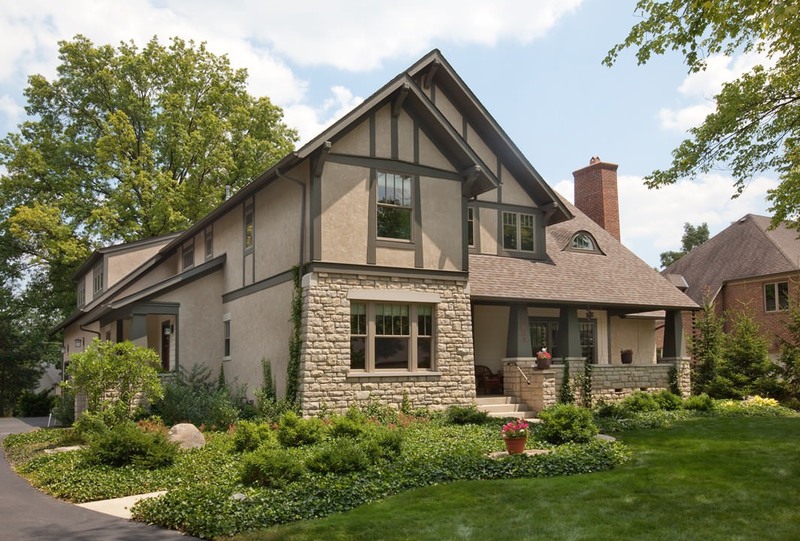 major advantage to older craftsman homes is the landscaping. 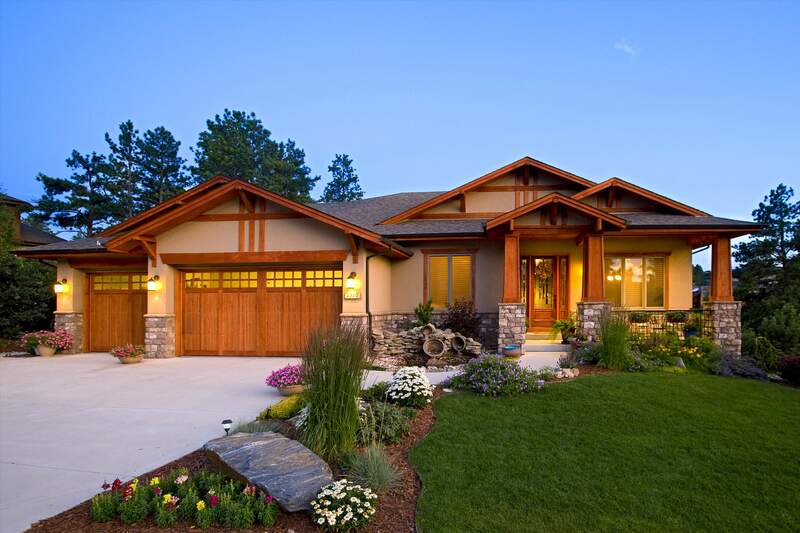 When the home comes with age, you get the mature trees and large landscaping to go with it. 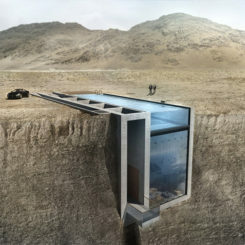 It means an instantly gorgeous house without breaking your back to get there. Bushes are fun landscaping options mainly because certain kinds are so versatile. Especially the ones that you can shape yourself. 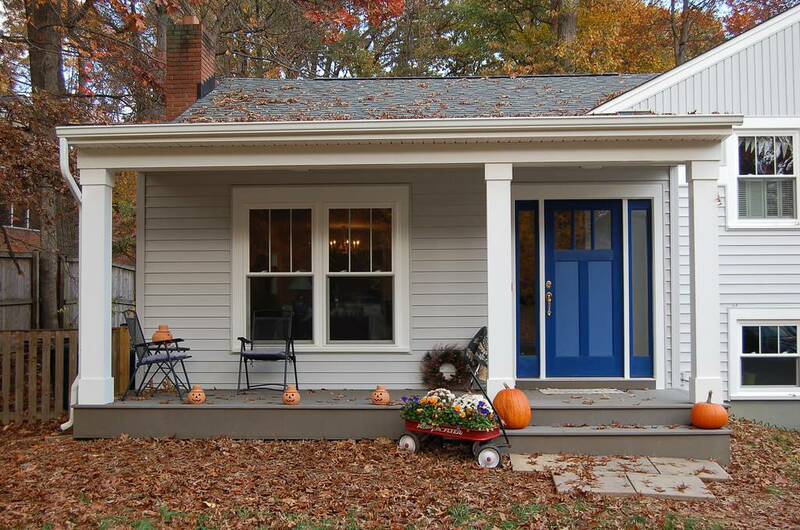 Let yours grow a little bigger than average to create some privacy on your big craftsman porch. to keep things simple if you prefer. 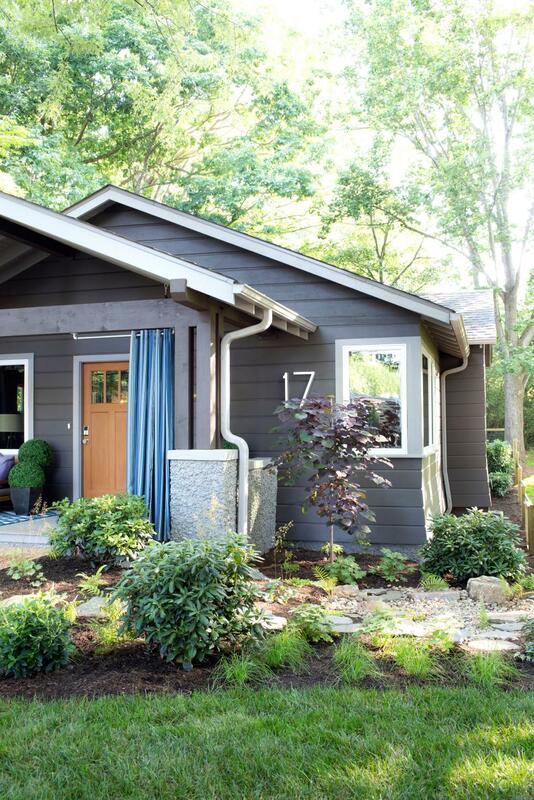 With one sprawling bush on each side of the porch, you have instant beautiful landscaping and all you have to do is add more mulch in the spring. 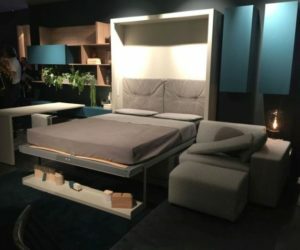 Want your beds to make a real statement on the block? Plant a tree by the porch. Not a very large one but something that will help give your view more height and interest. When you have large landscaping beds and not a lot of time to care for them, it’s time to to fill them. Ivy will do just that. Such a low ground cover allows for other bushes and trees to stand tall and create effortless beauty. Of course when you have the green thumb and love to be out in your garden, by all means, make your beds even bigger! 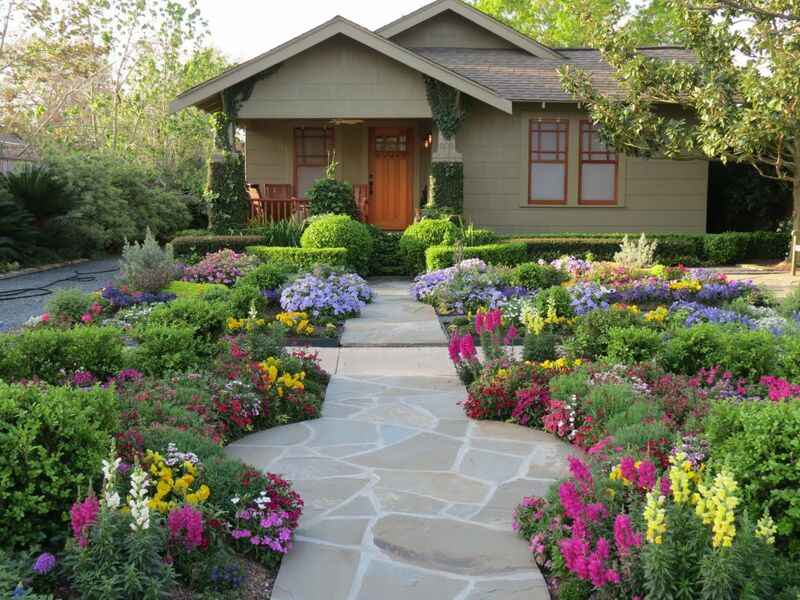 Bright floral beds will give your craftsman a cottage-y feel, not to mention nurture your gardening hobby. 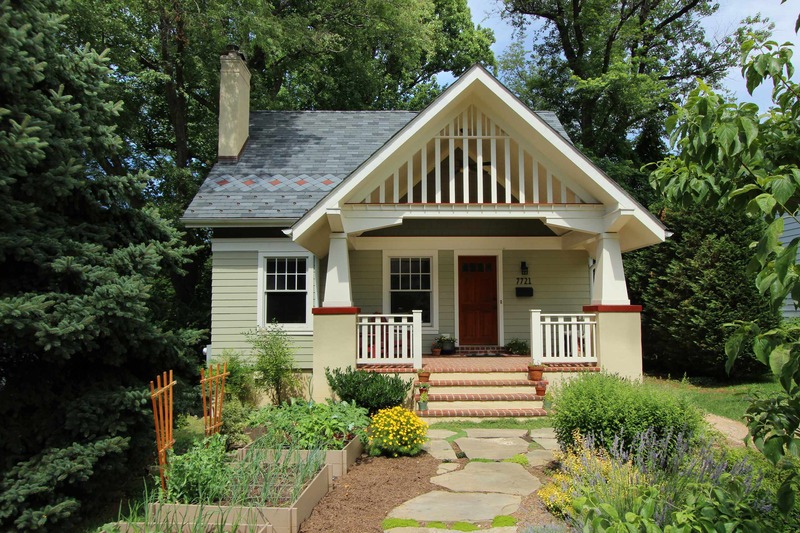 You might think that little bushes have no place in the yard of your stately craftsman home. You can however use them as a neat and tidy border rather than putting up a fence. Who doesn’t love a large flourishing rosebush? By filling your flower beds with them, you can get away with tending only roses instead of needing three or four kinds of plants to round it out. Looking for a opposite yet complimentary kind of landscaping? Try something that’s . 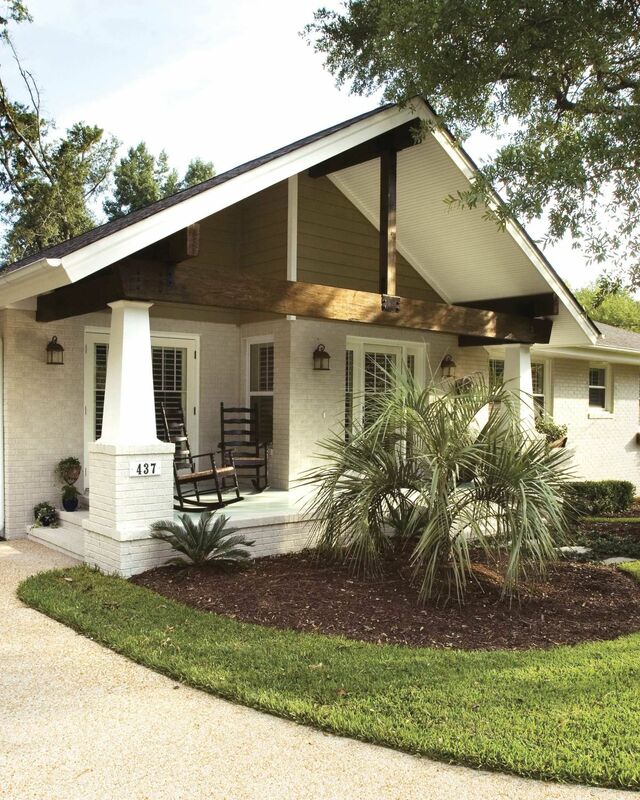 Ornamental grasses, ferns or palms will all add a touch of gracefulness to your broad craftsman porch and thick craftsman beams. Don’t forget to add layers for dimension. Even if all your plants are green, choosing them in different heights will give your beds a professional look, even if you have no idea what you’re doing. 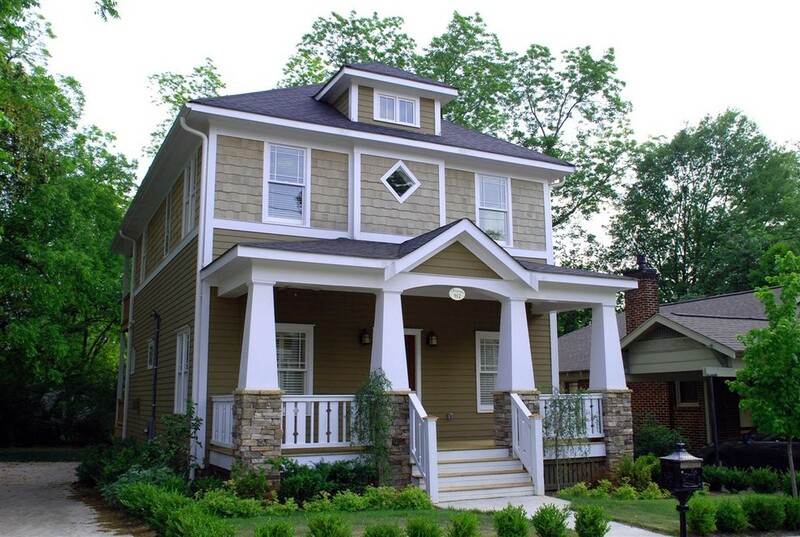 If your house is set high up with a sloping front yard, you will need to think of layers in a literal sense. Creating stair step beds lets you make the most of your square footage you won’t have to mow the hill. However, if you’re not into the stair step idea and would rather have a lawn, consider raising the entire lawn to match the front of your house. 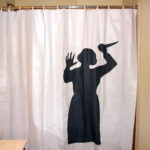 It might be a little pricey, but you give yourself a little more privacy in the process. forgo your lawn completely? Pave over it all. 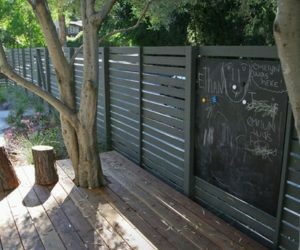 Leave your landscaping to a few well placed small flowerbeds and pots and then your kids will have plenty of space to ride their bikes all summer. prefer to use their yard space more productively. If that’s you, instead of filling your space with frivolous flowers and bushes, build some raised beds for a vegetable garden and use the mulched areas for herbs. You’re neighbors will love you even more if you share. 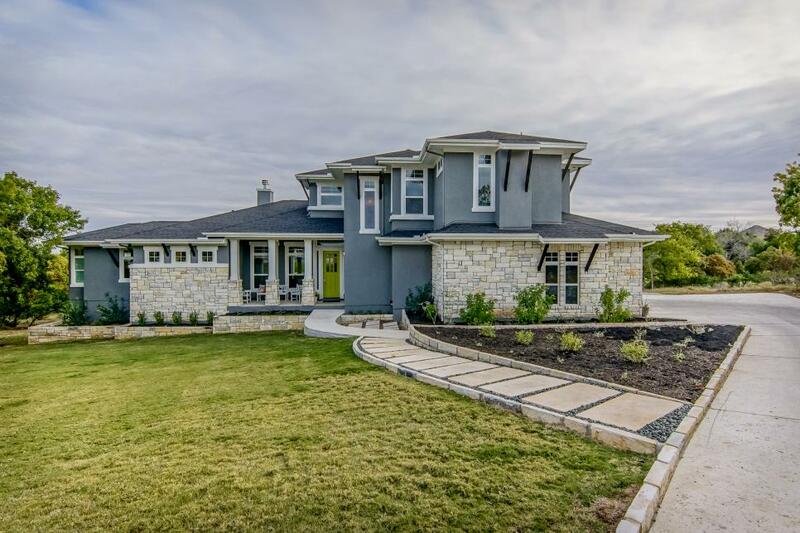 What good is landscaping if it only makes one side of your house look nice? 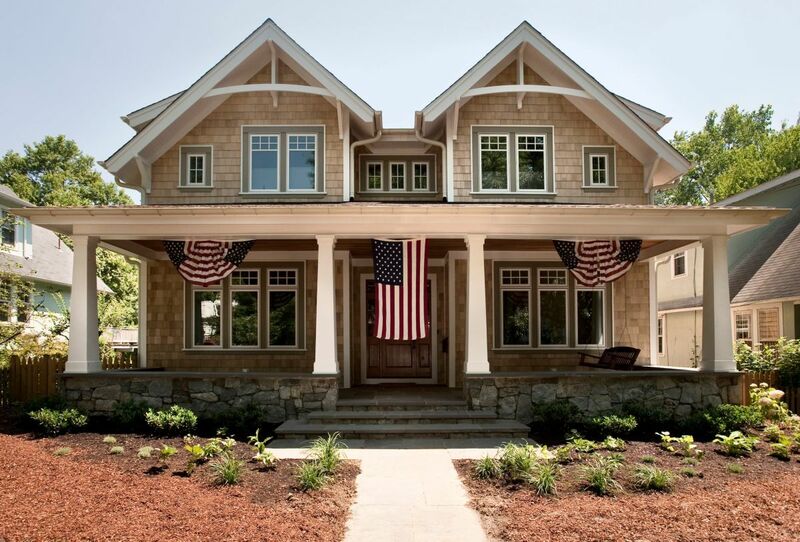 If your craftsman home offers all the opportunity for wrap around landscaping, take it! 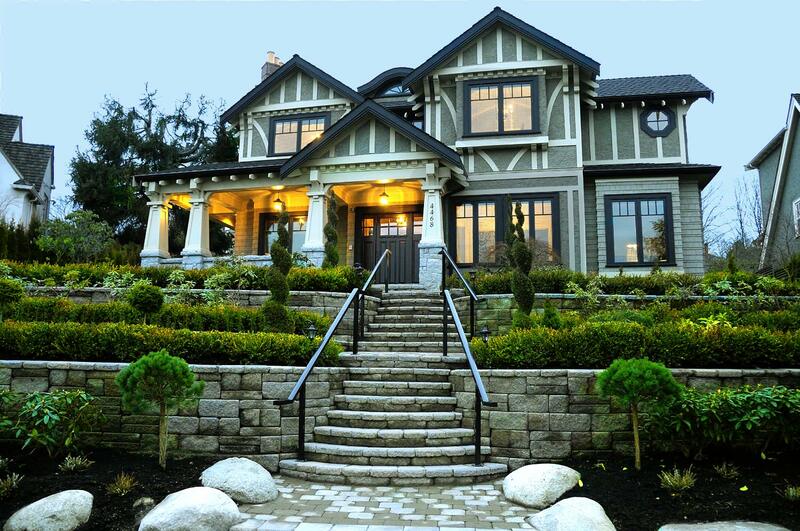 Your house will only look better from all angles which is never a bad thing. 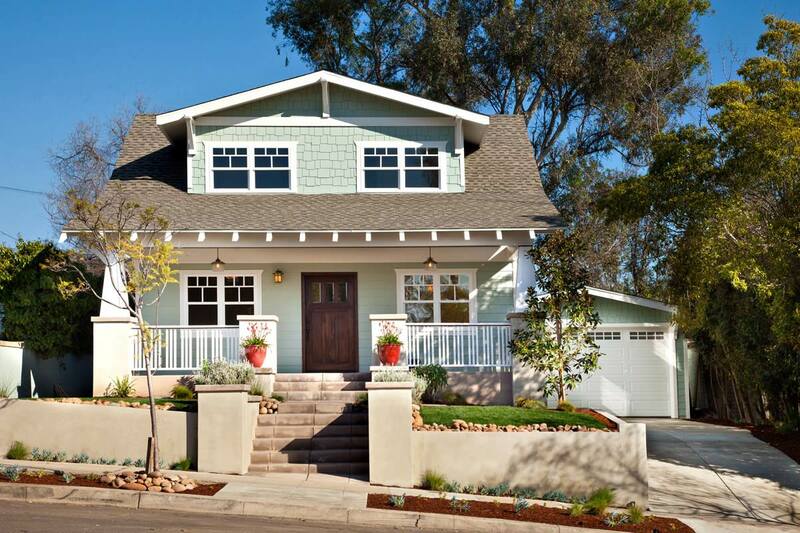 Newer built craftsman homes need to be careful with landscaping. It’s tempting to make your beds on the size of your bushes now, however when they grow they will be completely crammed together. 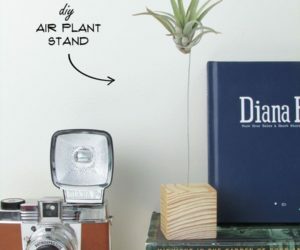 Give your plants room to breathe! 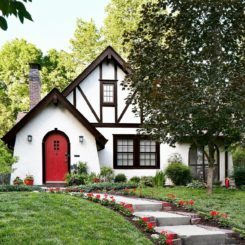 Is your craftsman sidewalk plain and boring? Then by all means, tear it out and start again. 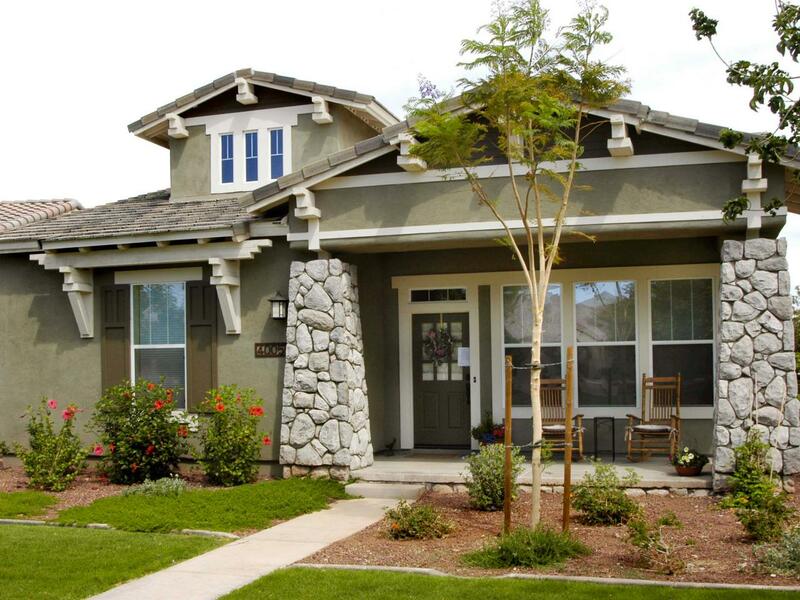 Add some brick to the mix of stone and wood to give color and variation to your home’s exterior. Stone is another great option for a textured walkway. 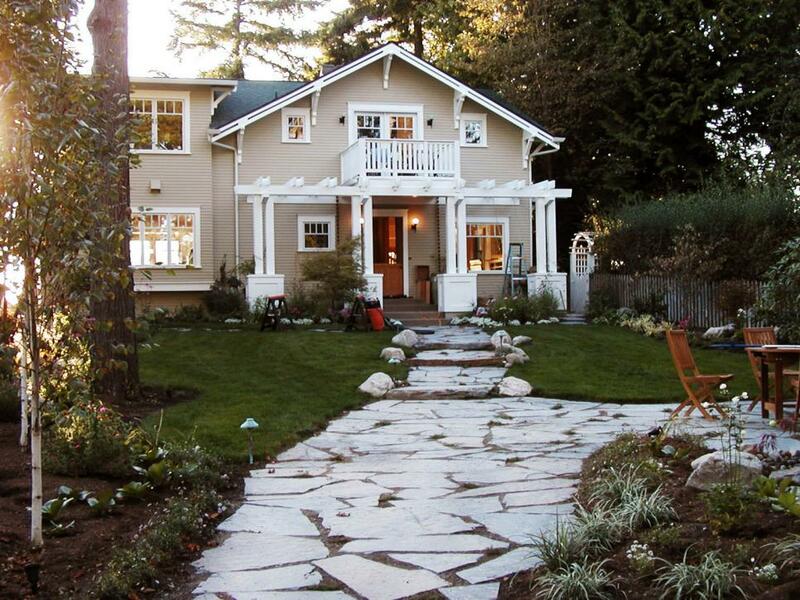 It fits right in with the craftsman theme and wears very prettily as the stones sink into the yard. Eventually it will look as old as the house is. Many don’t care quite so much about landscaping as they do about entertaining space. Use your budget to install a simple gravel patio that will be easy upkeep and give your alfresco dinner parties that rustic feel. Last but certainly not least, think long and hard about your front door. 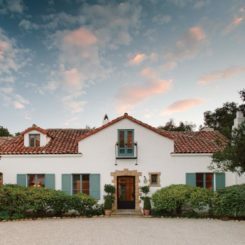 When the rest of your home is old and wizened, it can help freshen the place up to paint your front door a bright fresh color. Something that whispers of your own personality and your family. 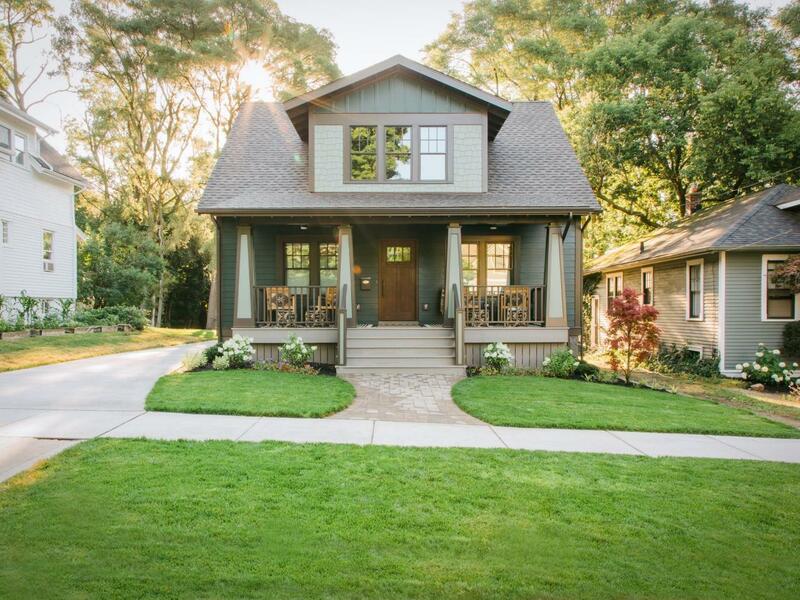 It’s the perfect welcome on any craftsman front porch.